Posted on Wed April 11, 2018 in Travel. Anna and the Innkeeper are off on holiday. There are places in South Africa that we have not yet seen, and this year we are going to make a determined attempt to whittle the list down. 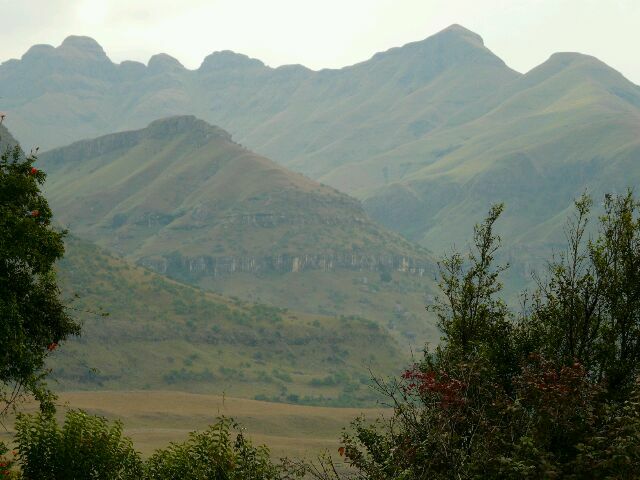 So we will wend our way slowly upcountry, through the Karoo, the Free State, the Natal Midlands, the Transkei and so back to Wilderness. Along the way we intend stopping where we are moved to stop and take our time to explore the countryside. We have no bookings - glorious freedom to do what we want, when we want and go where we want. The trip has, of course, been carefully planned to avoid all handbag-producing areas. After the debacle last year, when she returned with 12 handbags, I am determined not to be humiliated so badly again. Anna has been strangely quiet on the subject, leaving me somewhat at a loss. 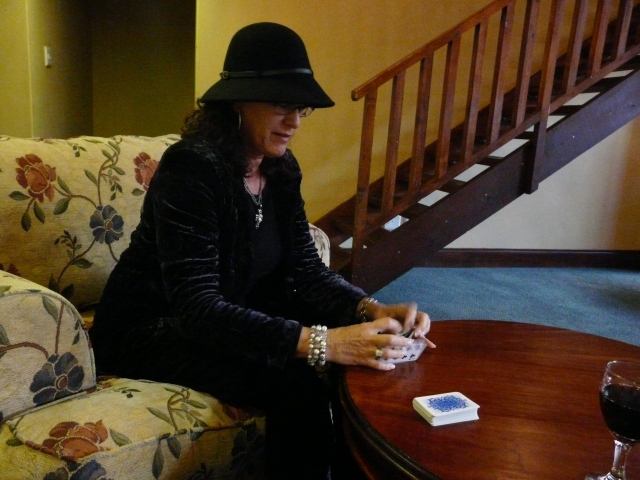 Could she be hatching a dastardly plot? Am I going to be caught unawares? Hah! I am alert! I am on guard and shall not be distracted! I am pure at heart and my strength is as the strength of ten! 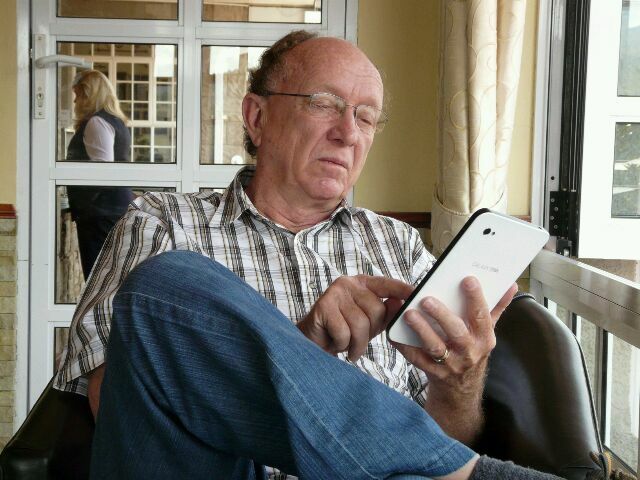 I recently acquired a Samsung Galaxy Tab. The rationale is that it will serve as Satnav, mobile phone, ereader, mp3 player and blogging tool, thus replacing 5 things and their chargers. We will see. 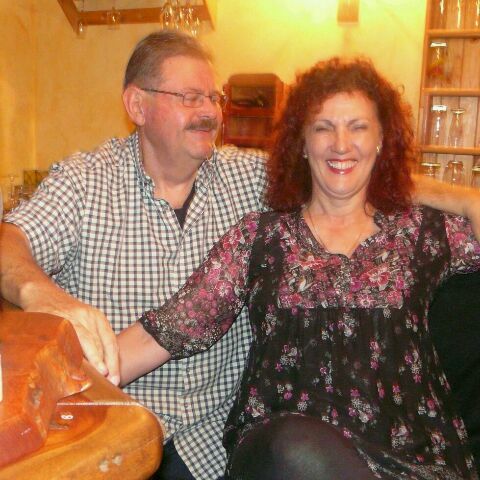 So - Magda and Ilza will look after Mes Amis. The guests are sorted, the dogs are sorted. Off to three or maybe four or maybe five weeks of no routine. Anna's sister, Hester, volunteered to provide padkos to sustain us through the morning. 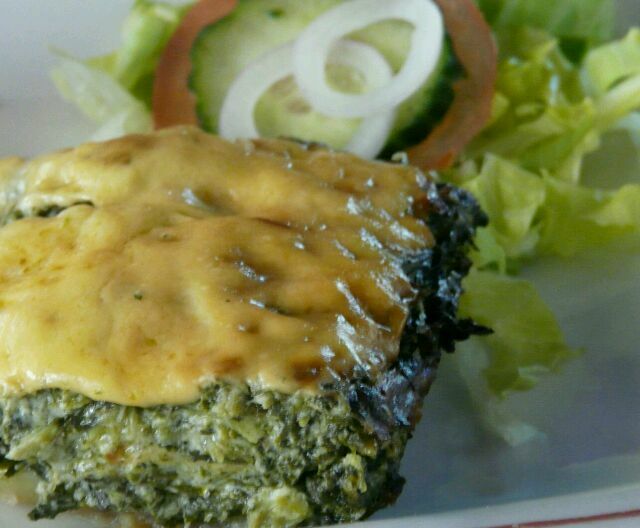 (padkos = road food or food to be eaten when embarked on a long journey). Hester did us proud. Chicken wings, frikkadels, jam sandwiches, ham and mustard sandwiches, various other samies, sweets, fruit, yoghurt, nuts, water, juice and a bagful of love. 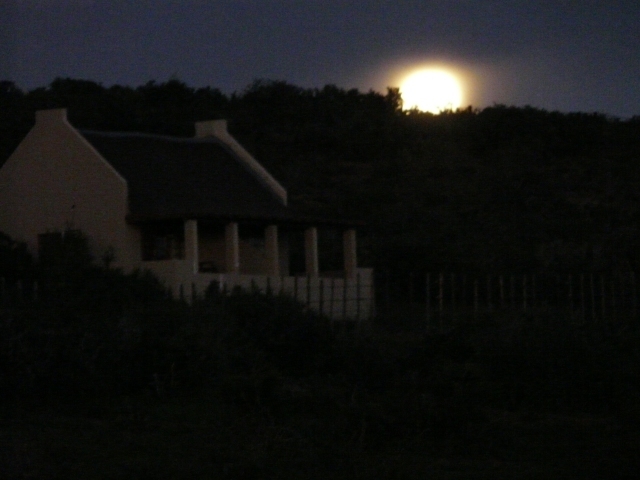 We will overnight in Nieu Bethesda, a one donkey town in the Eastern Cape. 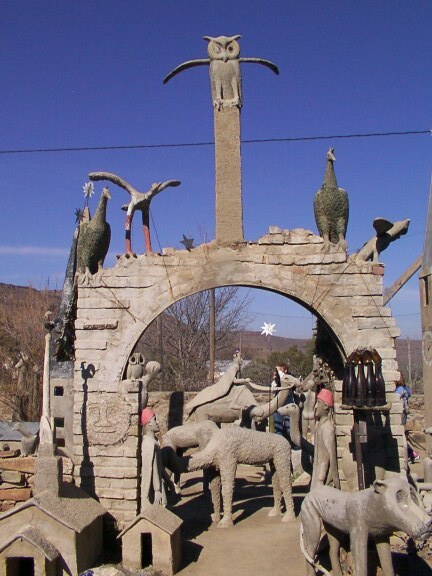 It is famous entirely due to the obsession of Helen Martins, an artist of dubious merit. 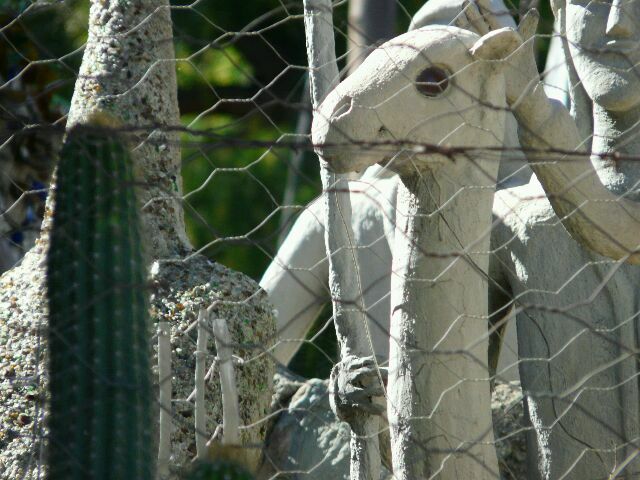 She embarked on a project to fill her property with concrete sculpturess. Owls, camels and people and stuff. All set out in scenes that made sense to her. The job completed in her 70's, she committed suicide. 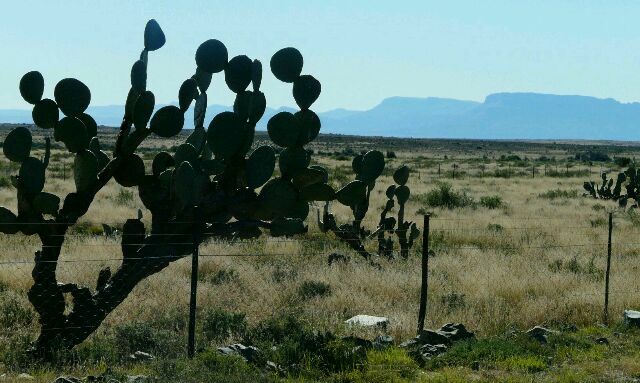 The road led us through the Small Karoo into the Karoo proper. 90km to Uniondale. Then 110km Willowmore. And so on through vast expanses of nothing. The very nothingness in time becomes peculiarly charming. A connection to an ancient land. 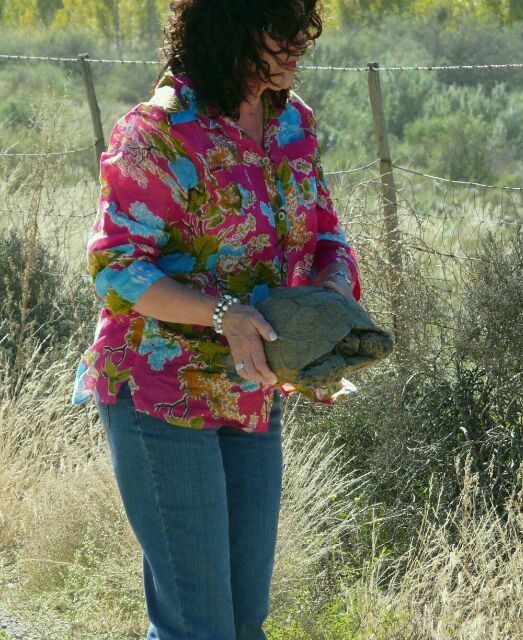 Approaching Nieu Bethesda we found a tortoise in the road. Anna did the rescue bit and deposited it safely in the bushes. There is not much to Nieu Bethesda. Dusty streets. The melancholic air of a place without identity. Some tourists around, trying hard to enjoy the visit. 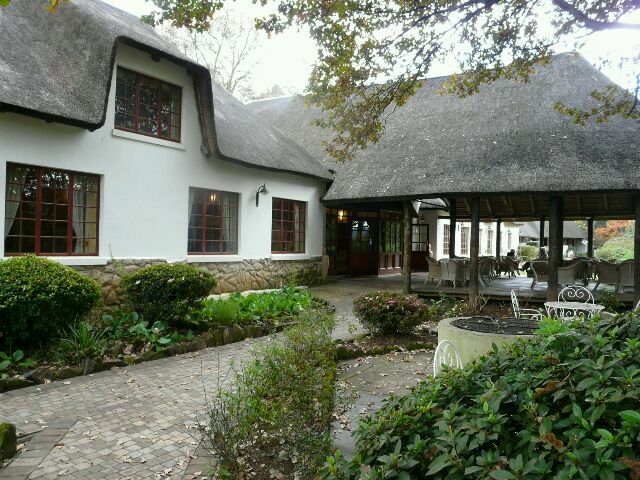 We found accommodation at Bruno's guest house and pizzeria. A somewhat rundown establishment but, methinks, probably as good as it can get in NB, as us old hands call the town. 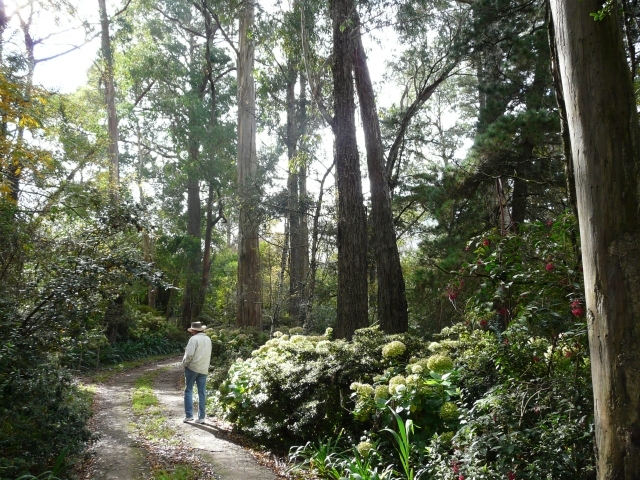 Off to Helen Martin's owl house. If you find obsessed people interesting, there is enough there for a PhD. Otherwise... well, we were in and out tout suite. By this time the sun had a watery look to it and we repaired back to Bruno's, opened a bottle of wine (we have three cases in the car) and spent a most pleasant afternoon reading. Anna battling through Jean M. Aeul's latest and me with Michael Connelly. There are only three eateries in NB, and we decided to stay with Bruno. 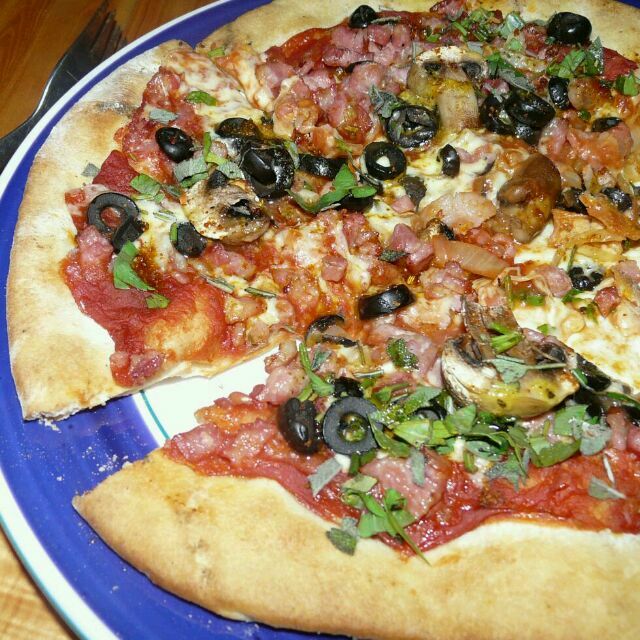 The menu consists of three pizzas and three pastas. You write your choice and table number on a piece of paper and submit that to Bruno for further processing. 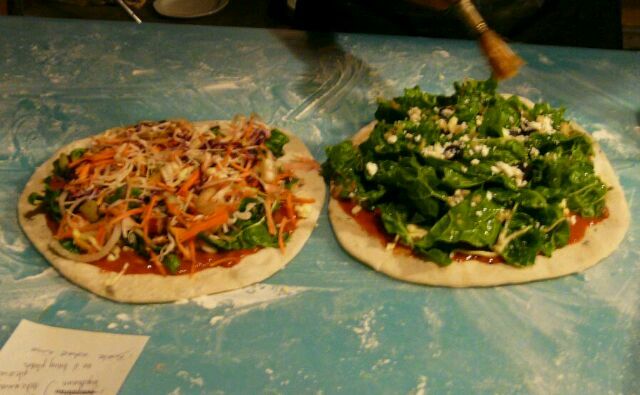 While submitting my order I noticed two pizzas ready for the oven. I was immediately clear to me that the pizza world is divided in two. Everyone else and then there is Bruno. The man who does not know half measures. I had never seen pizzas so stacked with a single ingredient. The spinach one was a tower of spinach at least 5cm high. Enough for four sheep and a goat. 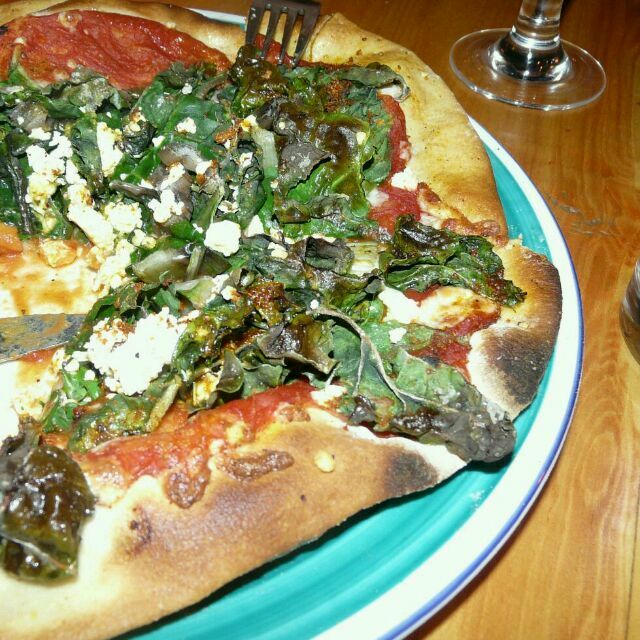 We ordered a spinach and an olive and ham pizza, drank wine and talked. Bruno and I sang, to the horror of the few other diners. The pizzas were surprisingly good. The next morning we took our leave of Bruno and visited the Kitching fossil centre. Mildly interesting. 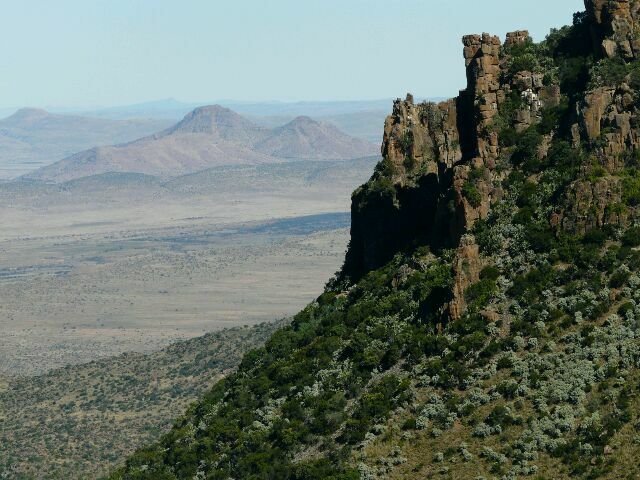 Outside town we passed a typical Karoo rock formation overlooking a fertile valley. 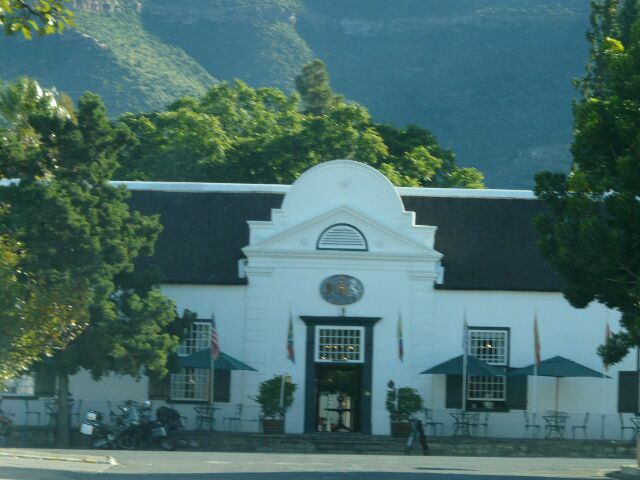 Off to Graaf-Reinet, where we intended staying one night. Sufficient time to see whatever GR, as we old hands call it. has to offer. 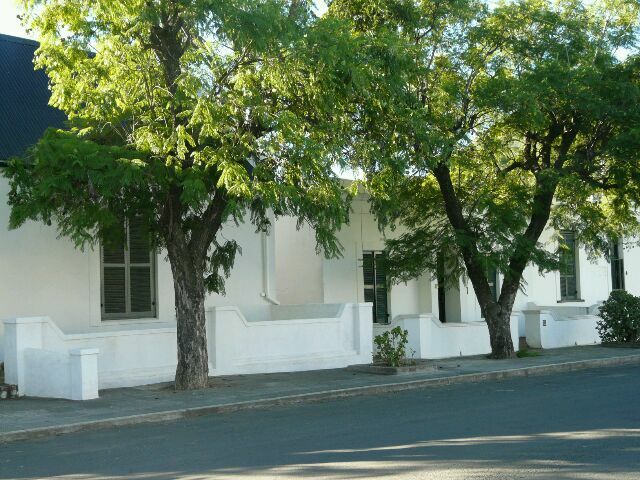 Graaff-Reinet was founded in 1786 by Governor van de Graeff. He either really loved his wife, Reynet, or added her name to the town to get out of a tough spot. 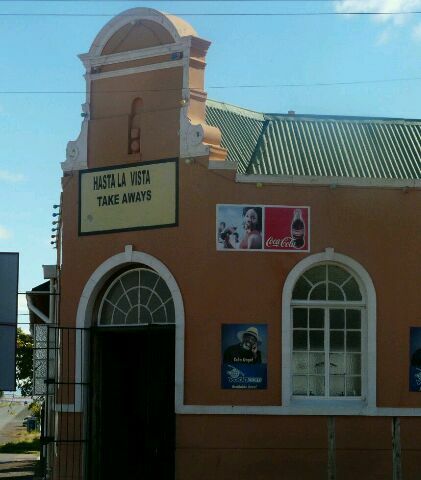 In any event, this makes the place really, really old in South African terms. We generally regard anything that existed before tv as ancient. 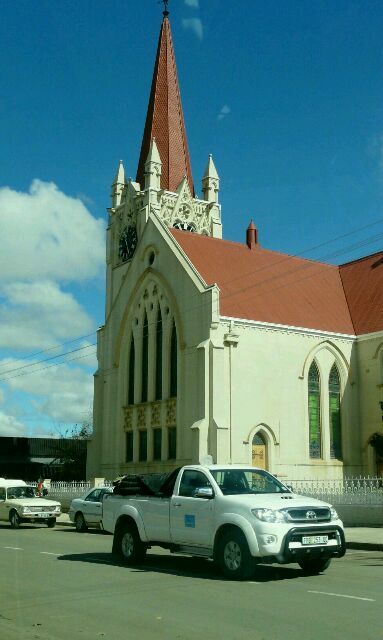 On that scale Graaff-Reinet is practically prehistoric. The town lies in the middle of the Camdeboo National Park. 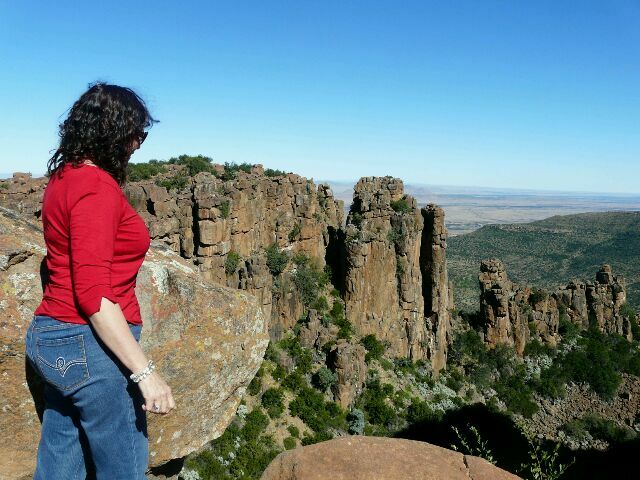 We noted when passing through on the way to NB, that it is also home to the Valley of Desolation. 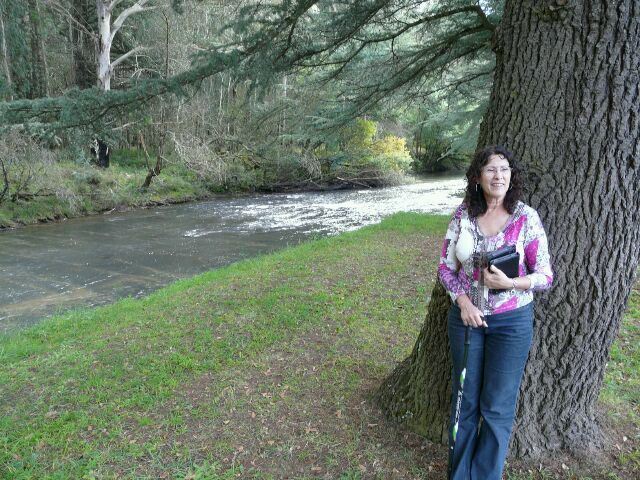 So, off to the Camdeboo Park we went. 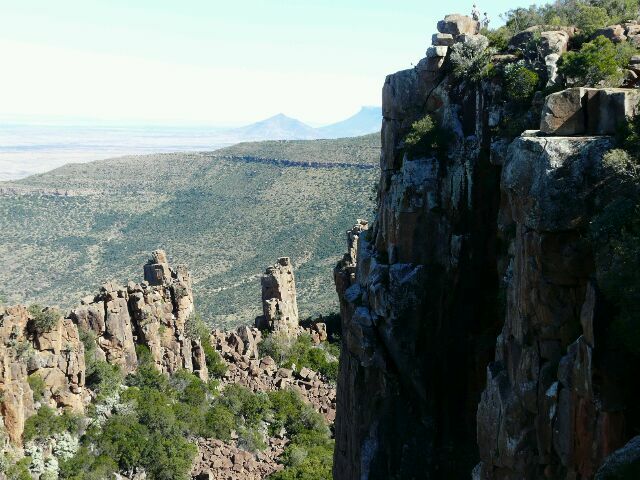 And to the Valley of Desolation. Sounds sort of hellish, doesn't it? "Sally, if you do not eat your pumpkin, I will send you to the Valley of Desolation." Just before the actual Valley- at its portals, one may say, is a lookout point. Where one can look out. Quite spectacular. 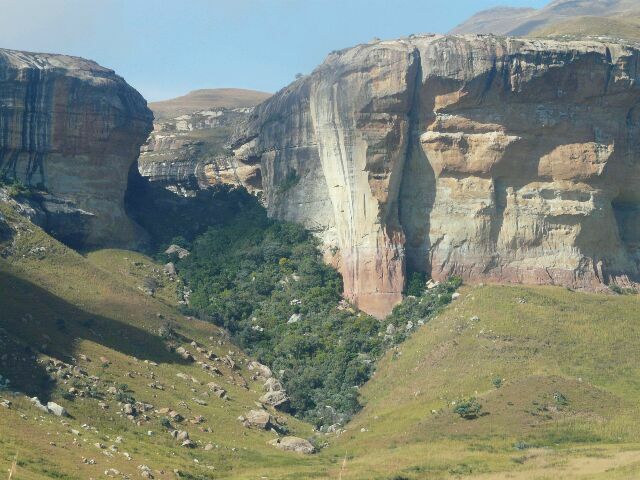 The VD, as is old hands say, is a small, isolated valley surrounded by magnificent crags and rock pinnacles. Formed, we are told by informative signs, when ancient mountains eroded. Magnificent. I just cannot resist pics with Anna in them... On to the town we went. 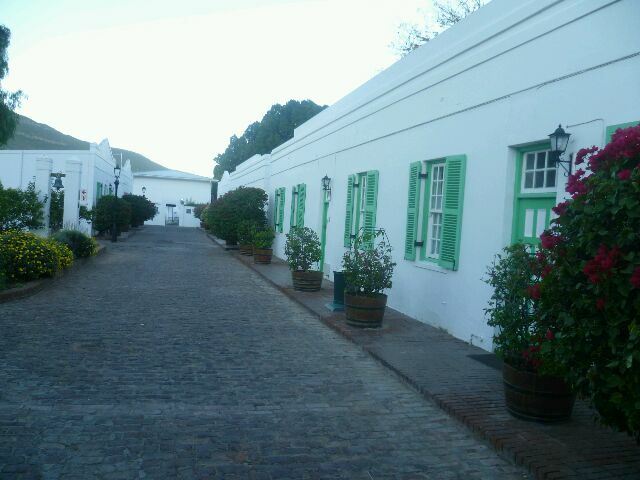 I tend towards cynicism, but Graaff-Reinet is one of the most charming towns in South Africa. It simply oozes charm. And class. We found a room at the Drostdy Hotel, built in the dim distant past. Lunch was obtained in a vine-coveted courtyard at the back. Burger pour moi and quiche for her. When we booked in, we requested a reservation for the restaurant which, so we were told, had a reputation for good food. We went a few minutes early to enjoy an aperitif at the bar. We discovered that we had no reservation and that the restaurant was fully booked. The Innkeeper was a mite upset at this news and spoke to the maitre d' as a father does to a son. 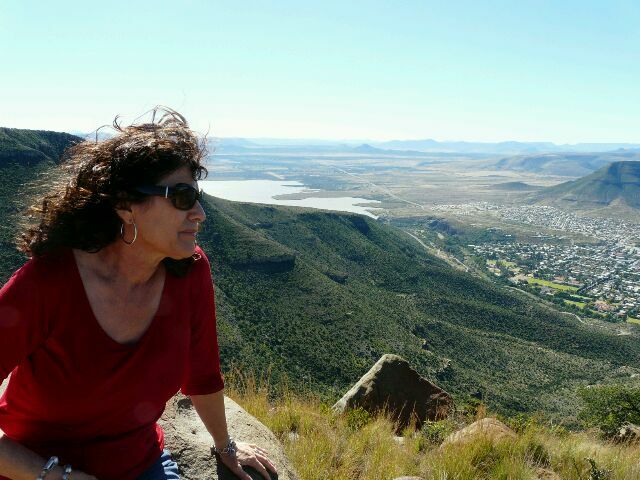 When it became apparent that we are likely to be left dinnerless in Graaff-Reinet, we decided to squat. We appropriated the first table for two we could find, ordered wine and sat back. Thereby rendering someone else dinnerless. Hah! Dinner was mediocre. Anna had a sad sole and I had to deal with lamb parts masquerading as loin chops. And not doing a good job of it. In the end we were out of there before the displaced folk arrived. Next morning's breakfast was reasonable to poor. 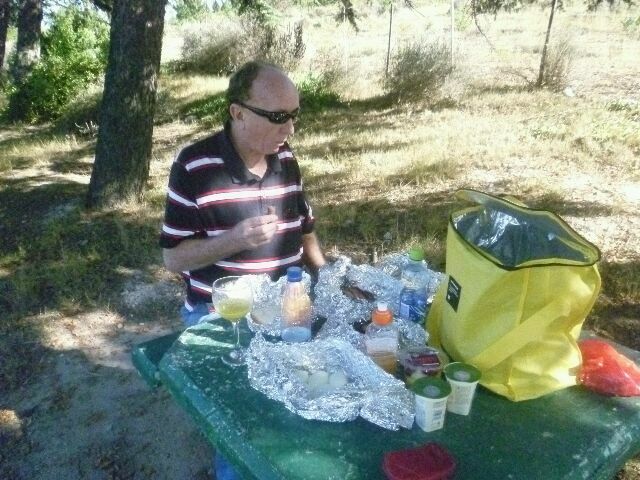 Do not look to find good food in the Camdeboo. Outside the hotel is a small curio shop. Anna went hither like a hound on the spoor of a fox. She found the most magnificent carving, which we immediately acquired. Could this be it are we into a curio battle? Or a carving dust-up? 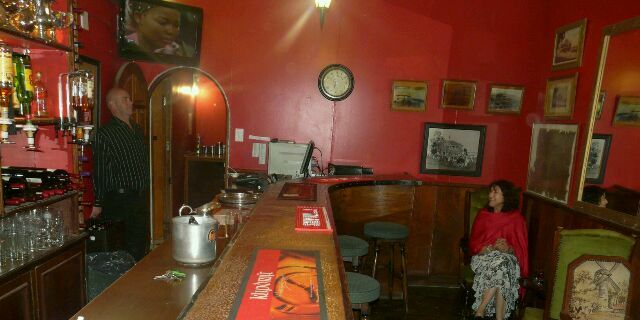 Only time will tell...... On to Cradock we went. 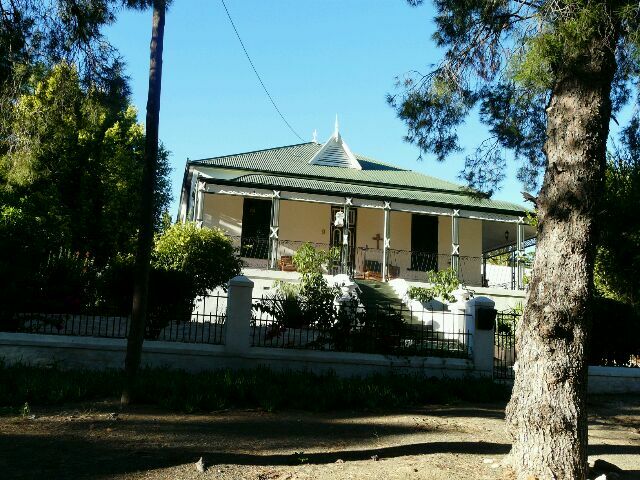 Cradock was founded in the early 1800's by Sir John Cradock. 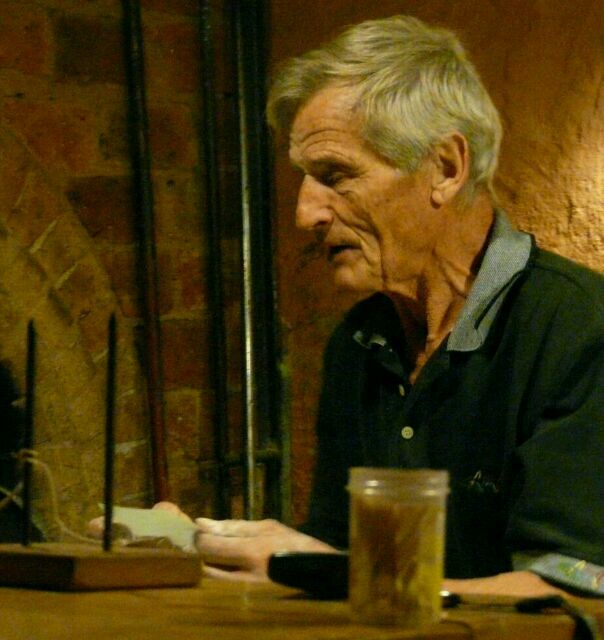 He was, amazingly enough, Governor of the Cape Province. Special favours for naming him? I bet there was a lot of politics at play. 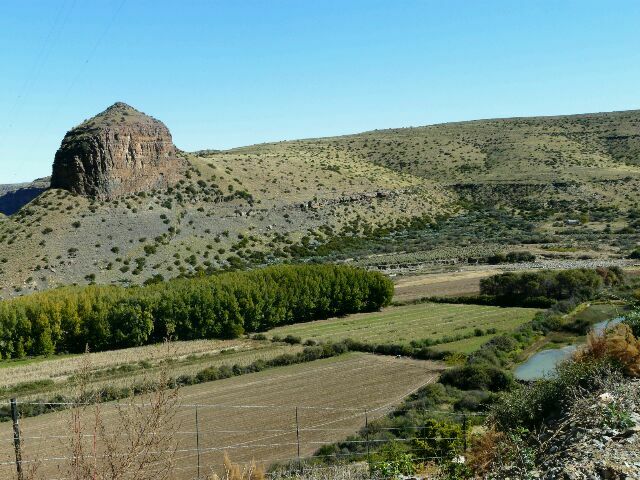 The road from Graaff Reinet runs through typical Karoo landscapes. 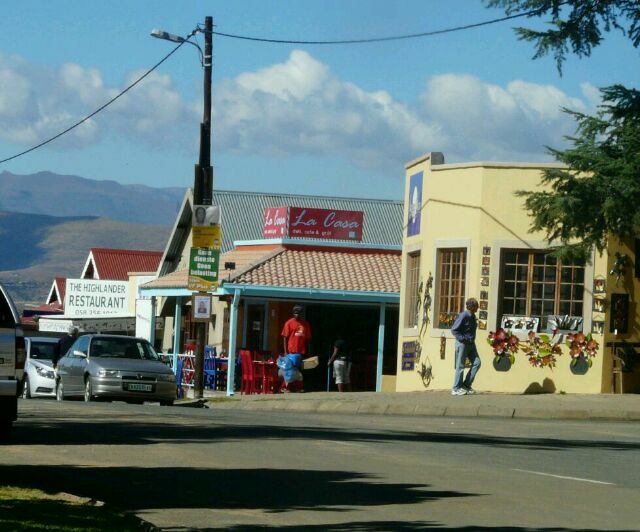 Cradock is sort of Graaff Reinet lite. Not quite as old, not quite as well kept, not quite the same. 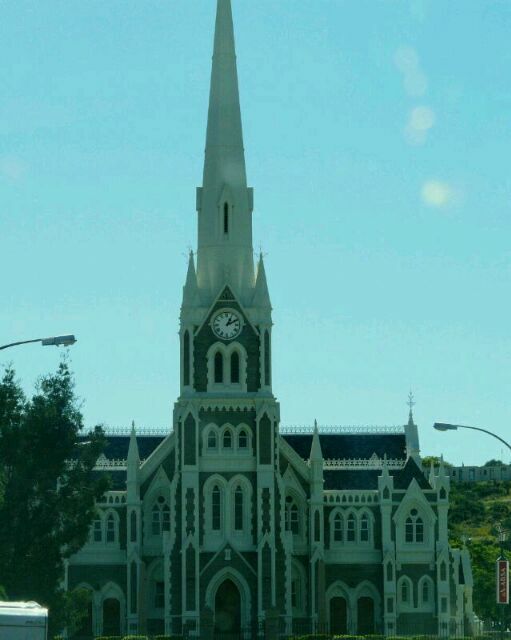 A feature of all Karoo towns, in fact of almost all of small town South Africa, is the Dutch Reformed church in the center of town. More often than not in Church Street. 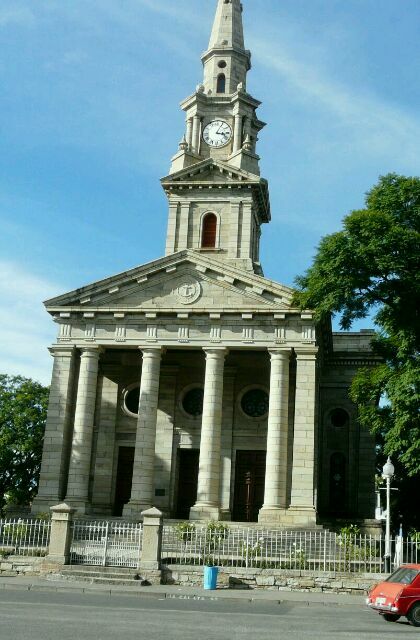 Here is the one in Cradock, designed in the style of St. Martin's in the Fields in London. 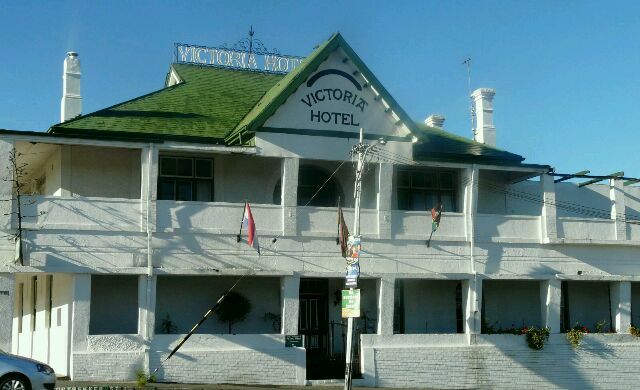 We found a room in the Victoria Manor Hotel. The hotel is a faded grand dame. It must have been a grand place. Long ago. 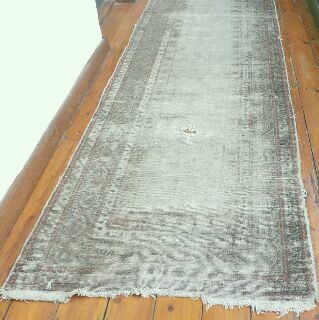 Now the carpets are faded, light fittings are without globes, here a window pane is cracked, there a picture is stained. All in genteel decay. But, by gad sir, she still has class. Let the evening fall and night draw a veil over her wrinkles, and she will charm the pants off you. Dinner was a buffet, but a good one. 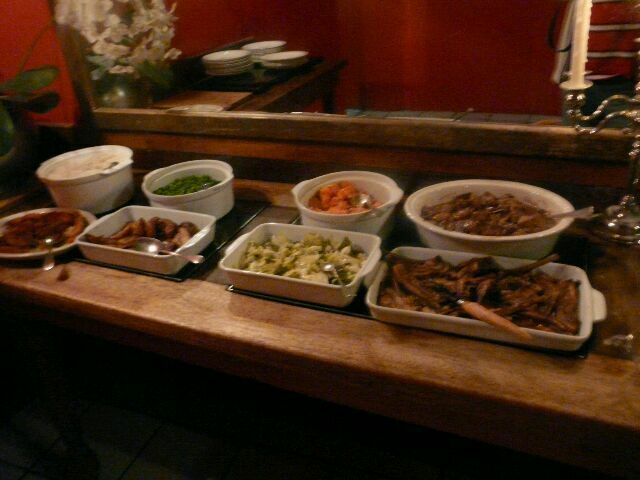 Simply prepared leg of lsmb, braised lamb ribs, honey and herb roast chicken, lamb stew and great veggies. Started off by a thick bean soup. I love food that is prepared with love. This clearly was. 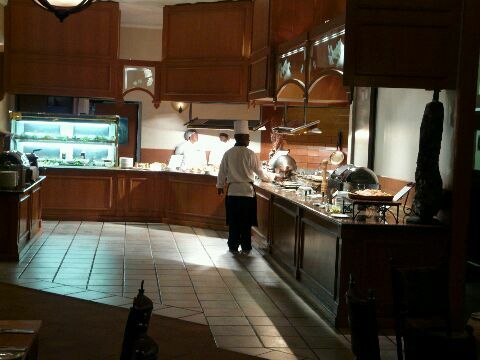 The service was excellent and the staff friendly from our arrival onward. Oh, to be able to spend a few million to restore her.. Anna: The Innkeeper does not realise that I am born under the sign of the lion. I am patiently lying in wait. Let him worry, let him set off on a false spoor. When the time is ripe, I will pounce.. 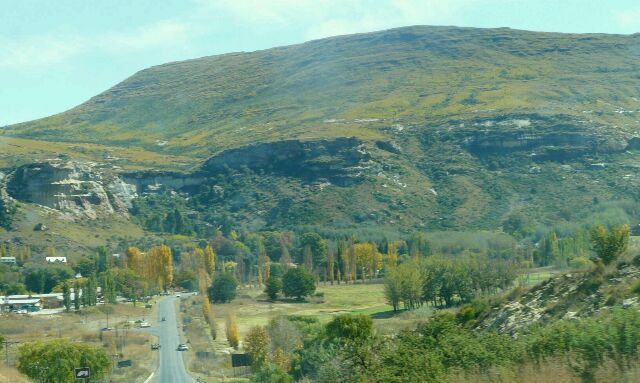 Between Cradock and Clarens lie vast swathes of countryside, with small towns dotted here and there. The road runs through Hofmeyr, Steynsburg, Burgersdorp, Aliwal North, Rouxville, Zastron, Wepener, Hobhouse, Clocolan and Ficksburg. Some 500 odd kilometers. 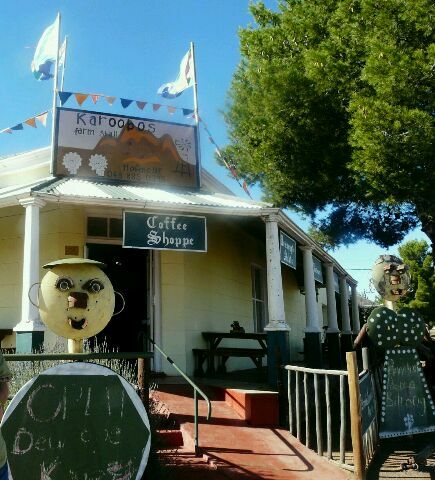 We stopped in Hofmeyr for coffee. 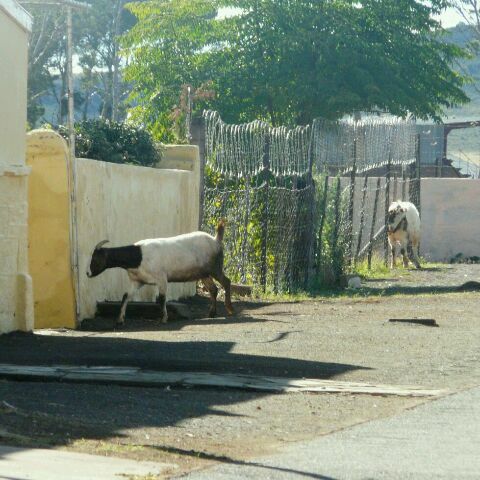 A goat meandered down the sidewalk. 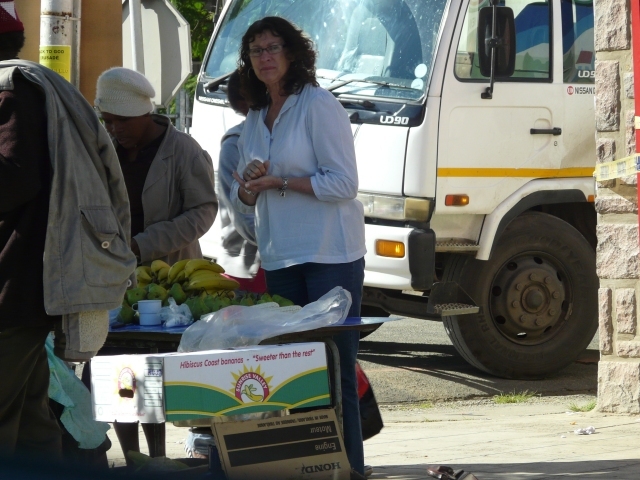 We decided to patronise the Karoobos farm stall rather than the establishment across the road. In which direction the goat seemed to be heading. 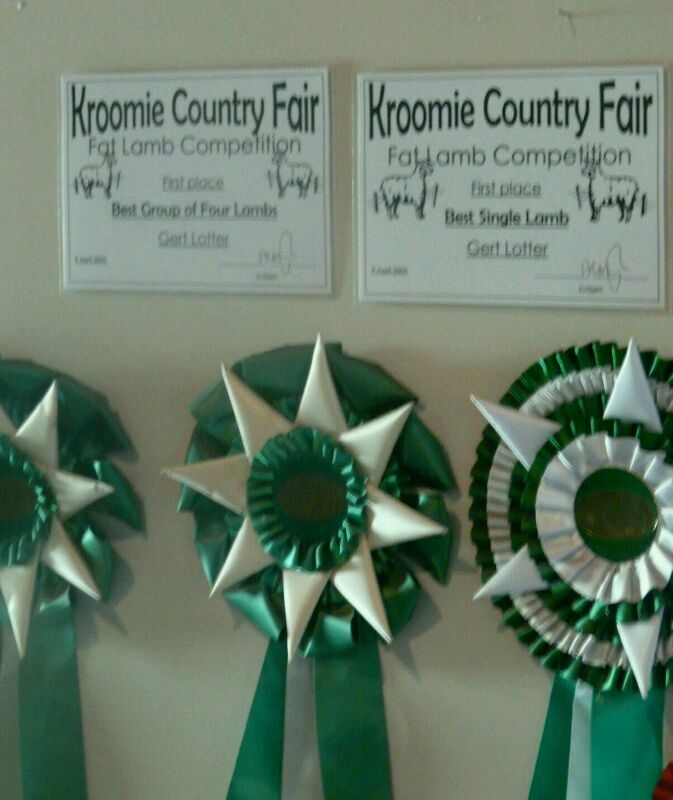 Inside one could admire the owner's achievements in the rather esoteric field of raising fat sheep. I would have thought it self-evident that the goal of all sheep farmers would be to raise fat sheep. This is probably why I am an Innkeeper - the sheep business is clearly too intricate for me. I am glad that, while attempting to drink the coffee, it was discreetly pointed out to us that we should not spit. We left, if not fortified, at least with our reserves of spittle intact. 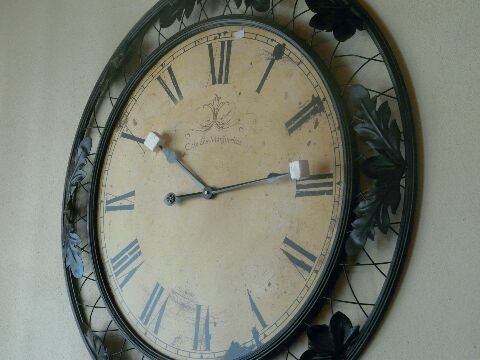 A small puzzle intrigued us on the way out - why do the clock's hands have small pieces of styrofoam stuck on the ends? 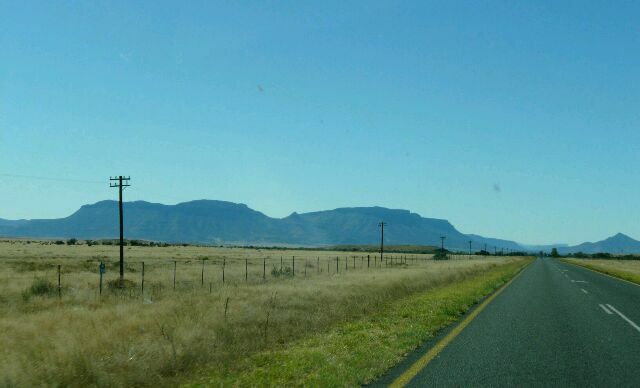 On we drove, still through typical Karoo scenery. 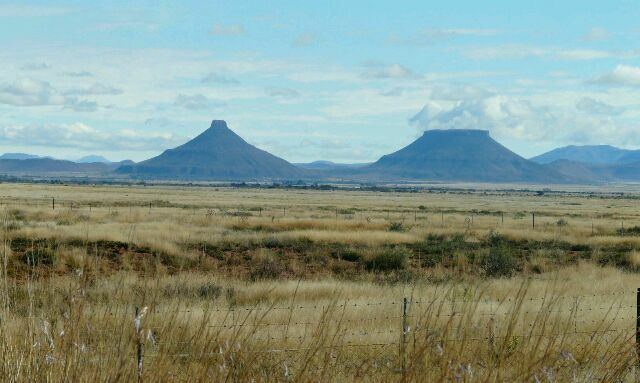 The one on the left should be named tietiesberg... We wanted to overnight somewhere, but decided to press on. The open road and the changing scenery and the procession of small towns became part of the destination. It was almost as if we had already arrived someplace. As if the journey is sufficient in and of itself. It helped, of course, that we were not obliged to continue, that we were free to stop anytime. A journey therefore not solely aimed at getting to a specific place. 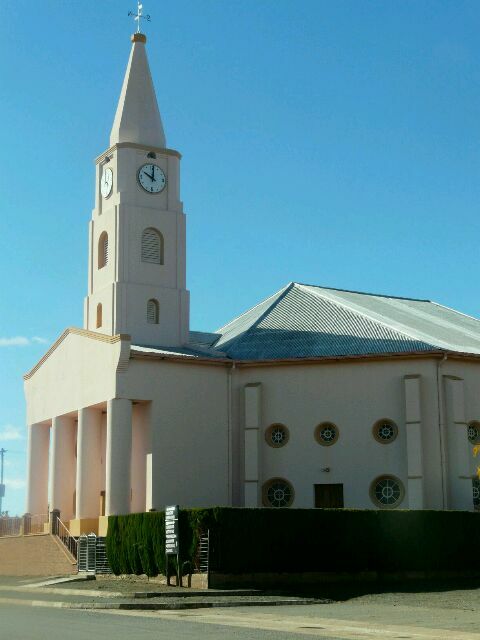 Each of the small towns had a large church. 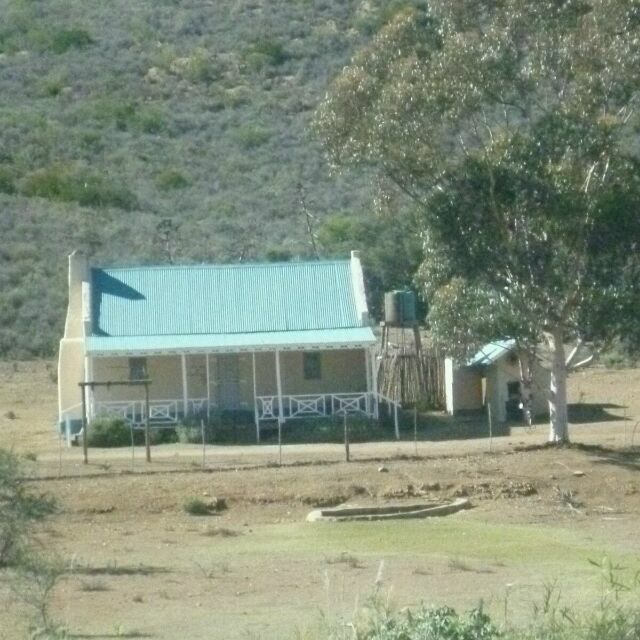 Sometimes somewhat incongruous in its grandness in a very humble setting, but still a moving testament to the piety of the original white settlers. Found a town. Build a church. 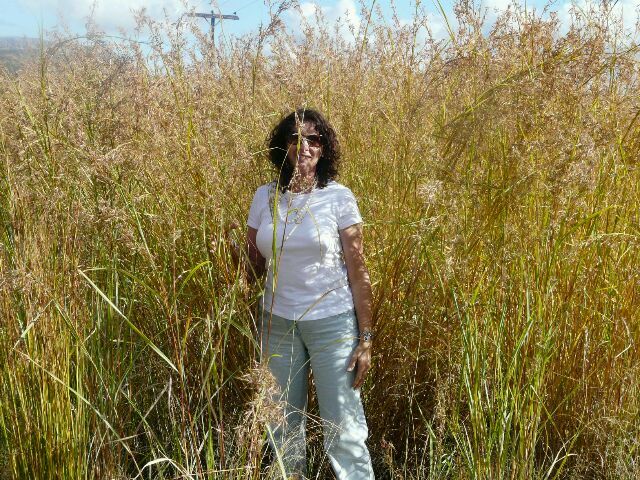 Anna in the roadside grass. 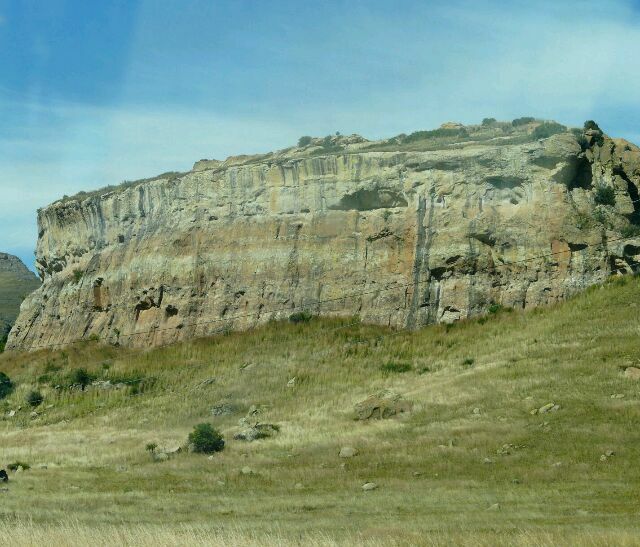 Approaching Clarens the landscape is defined by huge buttresses of weathered sandstone. A sidenote on the state of the roads. Except for a few kilometers outside Steynsburg, and the stretch from Rouxville to Wepener (which was struly awful), the road is in great shape. The bad parts are being repaired or remade. More verification for my stance that the popular pronouncement that "our roads are buggered" is simply not true. Some are, but most are not. We will revisit this topic at the end of our trip. 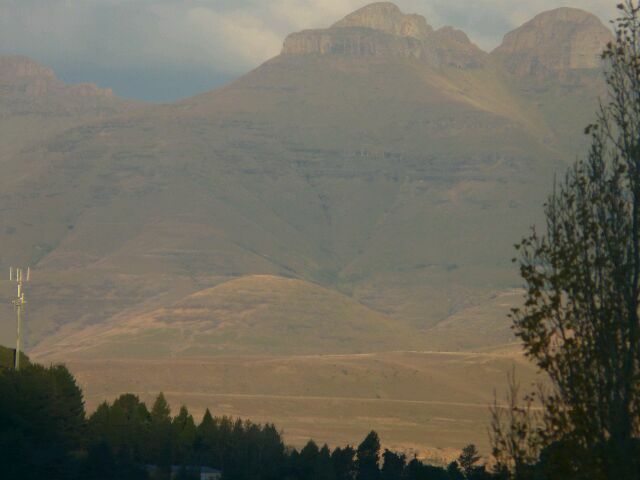 After arriving in Clarens we found lodging at the Red Mountain Inn. Great room mit fireplace und al, and a stunning view. Off to dinner. The place boasts 5 zillion eateries, most of which were closed on Tuesday. Probably to recover from feeding the hordes over the long weekend. Fortunately Clementines, highly recommended by all and sundry, was open for business, so thither we went. The wine was good, the food less so. In fact, bad enough that we refused to pay for it. Anna had what was touted to be a sole thermidor. 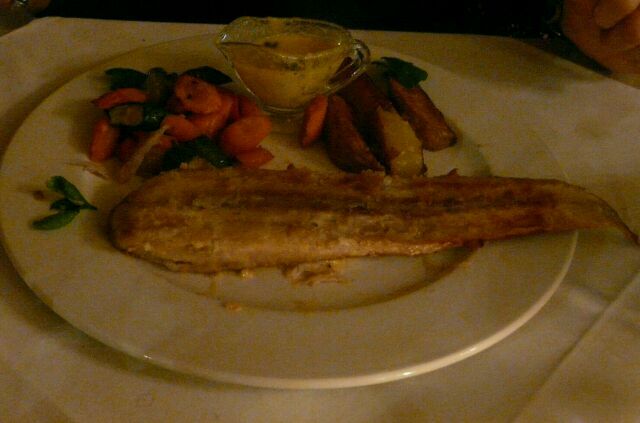 She got a tired old fish with a small bowl of bechamel sauce on the side. 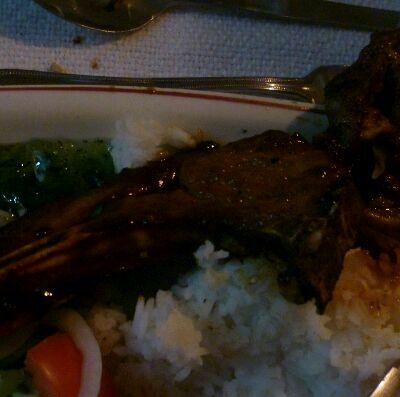 I will spare your appetite by not publishing an image of my lamb chops. "And the winner of this year's competition for the category best fat and tough lamb is..." If you see a pattern here of the Innkeeper sticking to lamb, you are correct. I will honour those who spend their days agonising whether their sheep are fat enough. In fact, I am contemplating founding the Fat Sheep Breeders Support Society. With our own page on Facebook. Writing to Ministers. The political variety, not the religious ones. By that I do not wish to imply that politicians cannot be religious. But you know what I mean. The owner did not quibble when we refused to pay. At least not much. He must have seen the glint in the Innkeeper's eye. 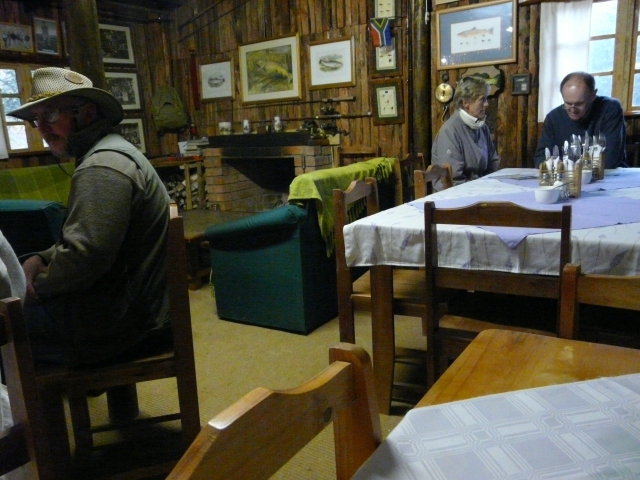 The next morning we had a reasonable breakfast and set off to explore Clarens. Not that there is a huge territory to traverse. Mostly lots of twee little shops and a gadzillion restaurants located around the village square. This would also serve, I thought to gain some insight into Anna's thinking. By shrewdly observing her focus of interest it must be possible to glean some inkling of her thinking. The highlight of the day was the custard slice we ate at Valley Cats. The thing was superb. The usual pastry on top, but below was a light and airy filling - almost not a custard. Probably a whole bunch of whipped egg white in there. Anna bought the odd small thingy. Mostly for the grandchildren. We peered at fine art, trying to look knowledgeable. We looked at oodles of overpriced decorative art. And nary a twitch revealed her purpose, nor a glance her dastardly plan. Damn! Tee-hee We must have done something wrong. To be punished like this with bad food. It is not as if we are picky foodies. 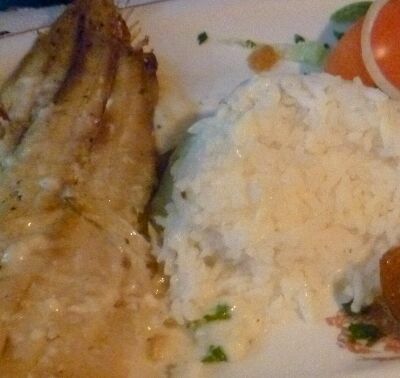 We appreciate all food that is prepared without pretense and with love. 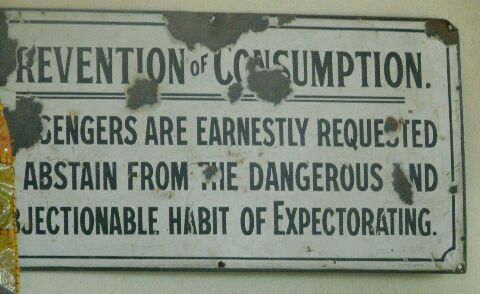 Despite this we seem to bring out the worst in the eateries we encounter. 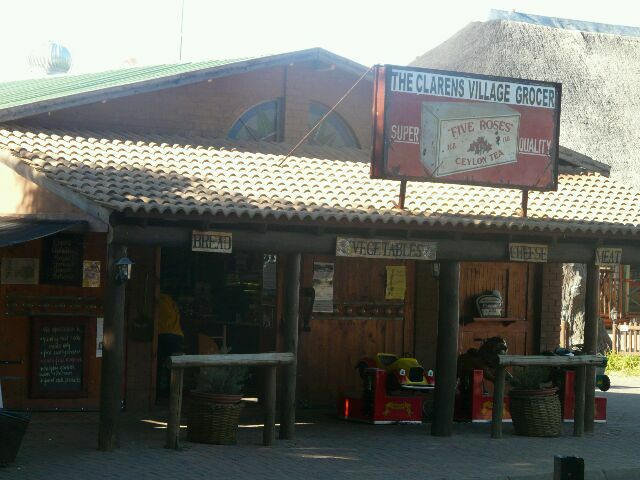 Lunch on our second day in Clarens was a case in point. (I'll skip breakfast. It was the same old same old. Floppy bacon only suited for swatting flies, dry yellow stuff masquerading as eggs.) 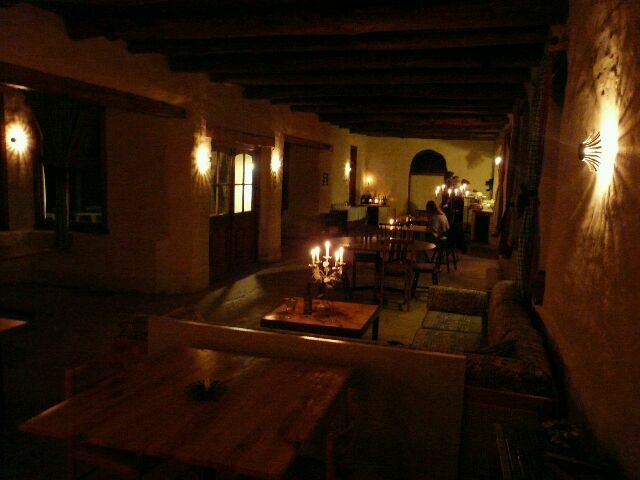 We wanted something small and thought Vito's, an Italian place below our guest house might be just the thing. Hah! 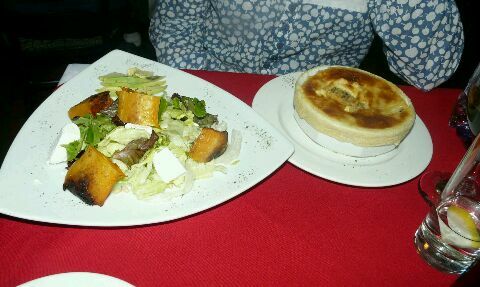 A garlic focaccia and two portions of snails, accompanied by a modest merlot was ordered. The merlot was quaffable, the focaccia was fine and the snails were vrot. As in off. As in stinky off. We are doomed. Doomed I tell you. Anna thinks it is all due to stuff left over from the long weekend. So maybe the lesson is not to visit isolated villages just after a long weekend..... We spent the afternoon snuffling around the shops and coffee places. Most pleasant. The evening's dinner was due at The Highlander. Anna had a chicken pot pie that was pronounced very good. 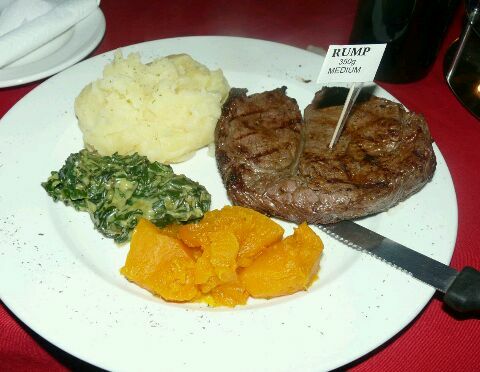 I tried rump steak. It was not bad. Not great, but not bad. Maybe we are breaking our streak. The twee little sign on the rump is in case the chef mistakes it for calamari. 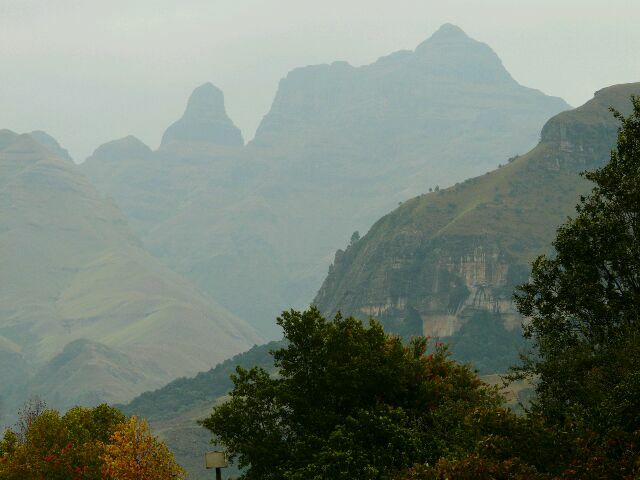 We left Clarens the next morning with no intention whatsoever to return. It is a pleasant enough place to spend a few idle hours, but does not have enough to sustain our interest. There is something distinctly faux about it. 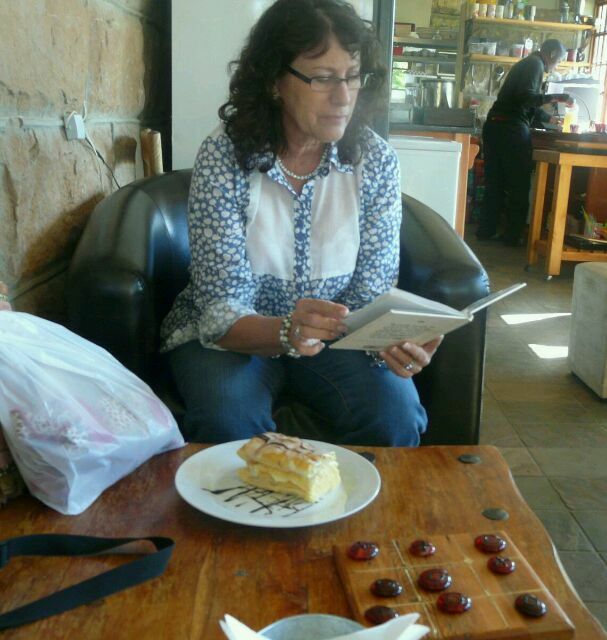 Anna's sister, Drien and her husband Christo phoned to tell us that they were in the Midlands for a few days and we agreed to meet at their lodging, Sycamore Tree Houses near Mooi River. So, we went thataway. 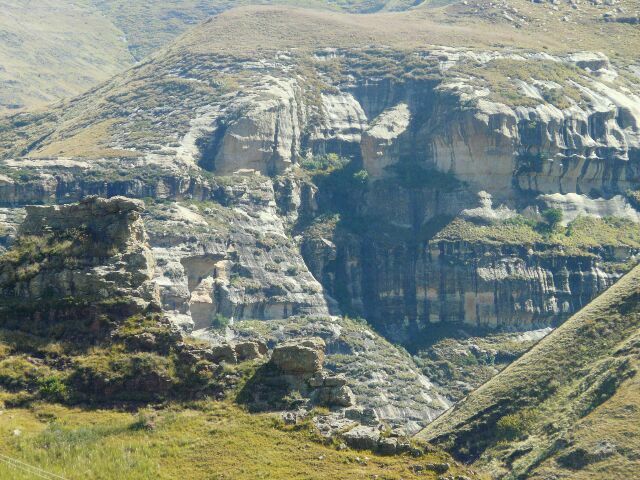 The road leads right through the middle of the Golden Gate Highlands Park. 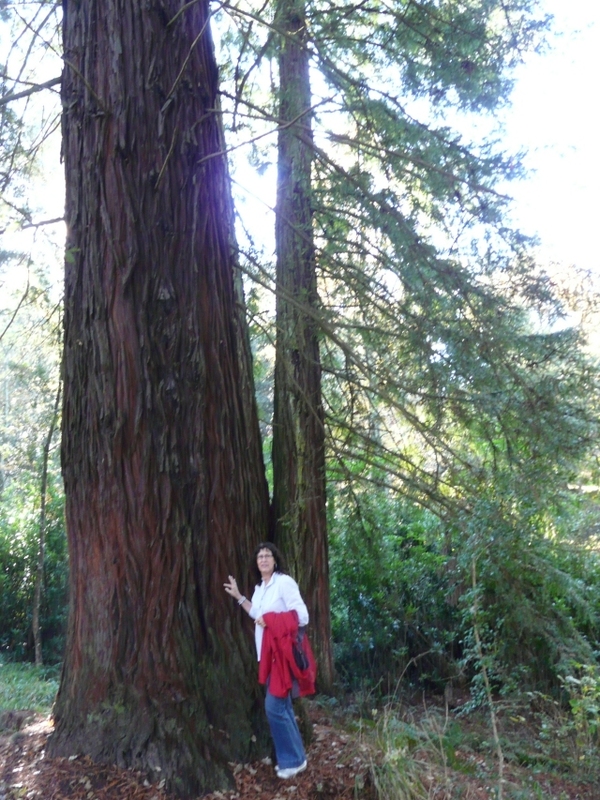 We were bowled over by the beauty of Golden Gate in Autumn. What a drive! Highly recommended. 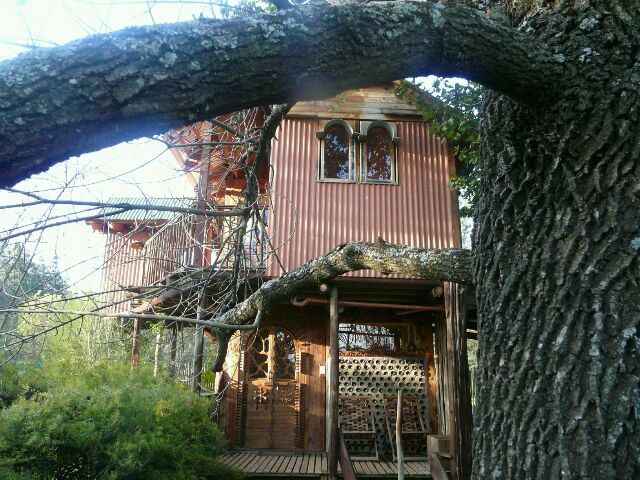 We met up with Drien and Christo and checked into our tree house. Dinner was due at the lodge, but more about that later. Off to the mountains in the morn. I got complaints from Anna that the pic of Drien and Christo in our previous post is a bad one. According to her, it makes them look like Bonnie and Clyde. So, in the interests of matrimonial harmony, I hereby publish a retraction. The pic in the previous post is actually not one of Drien and Christo. Any resemblance is accidental. Here is what they look like. 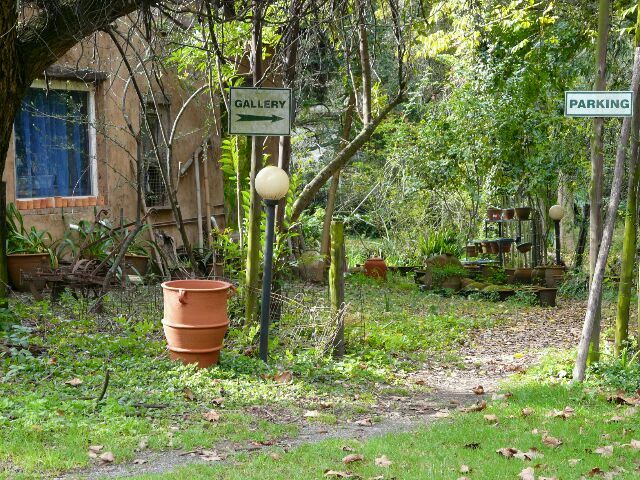 The Sycamore Avenue Tree Houses was interesting. Each was built and finished using unique woodwork. 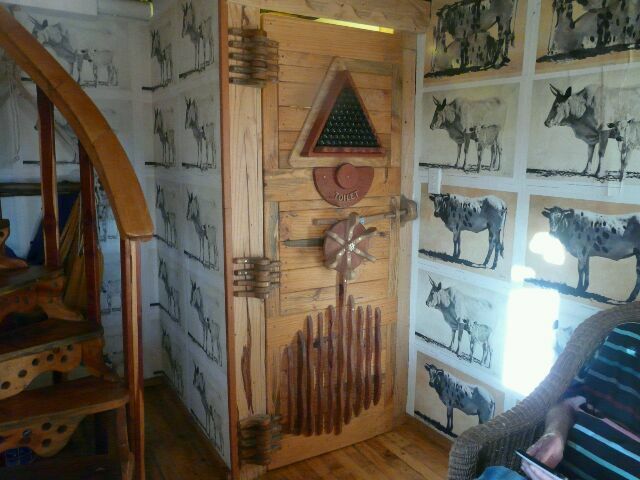 This is the door to our loo. Dinner was ok. Homestyle cooking. A modest buffet in an uninteresting and characterless dining room. The woodwork in the rooms is interesting, the tree house concept sort of faery-like, but in the end the consensus was that the place is way overpriced at R750 per person, dinner and breakfast included. The folk running it are friendly and engaging, but are clearly in need of some professionalism. After a modest breakfast we bid adieu to Bonnie and Clyde and set off for Cathedral Peak. 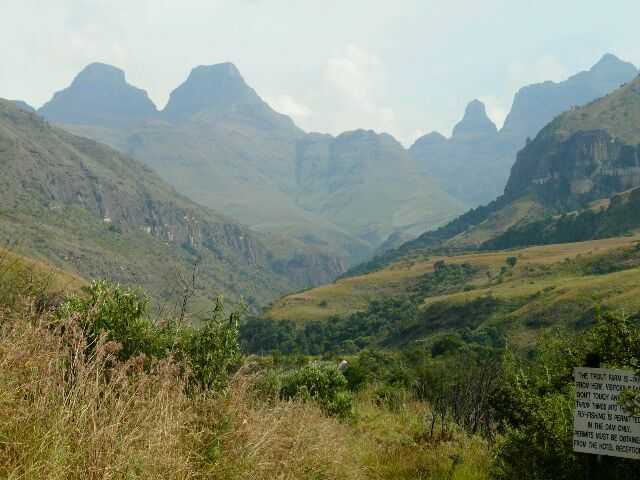 We wanted a spot right in the Drakensberg and CP, as us old hands call it, seemed to fit the bill. 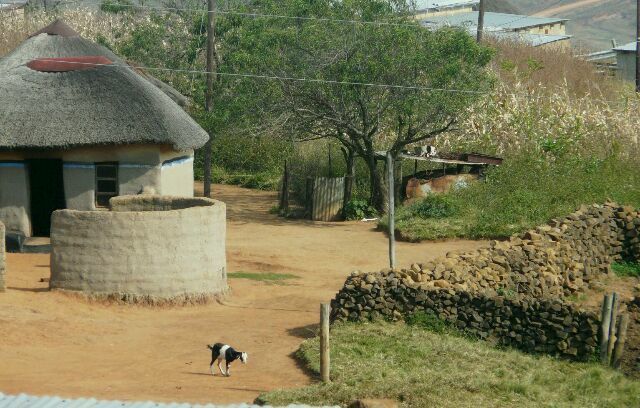 We wend our way through rural Kwazulu Natal, the landscape dotted by houses, huts, schools, kraals, cattle and goats. We were forcibly struck by the thought that the kids we saw running around the school grounds would have had no high aspirations only a few years ago. A bleak future. 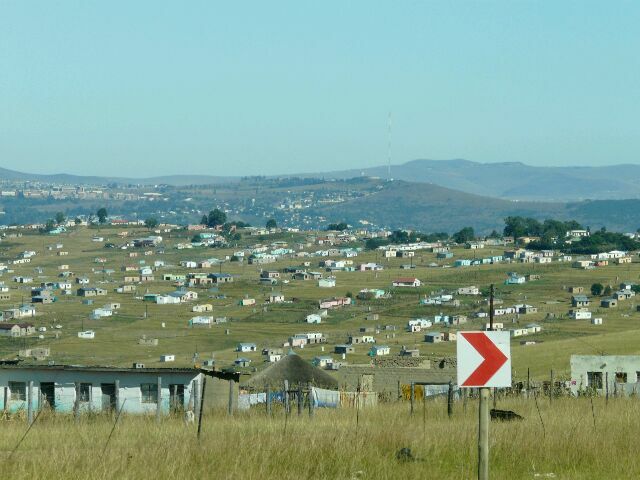 A hardscrabble existence in the countryside where apartheid neatly segregated them. Not that it is easy today. Unemployment is high and opportunities are limited, but at least there are no institutional barriers to getting somewhere. 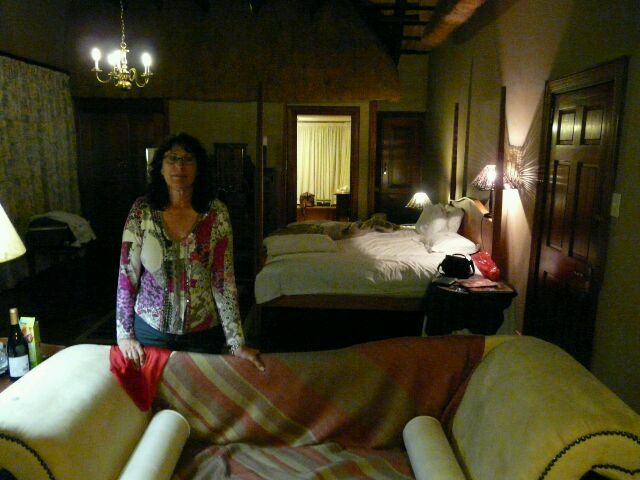 We managed to negotiate a 30% discount at the Cathedral Peak Hotel and booked the honeymoon suite for two days. Stunning room with stunning views. The hotel bar where we lazed the afternoon away must rate as one of the best view bars in the world. We had a goodish dinner. 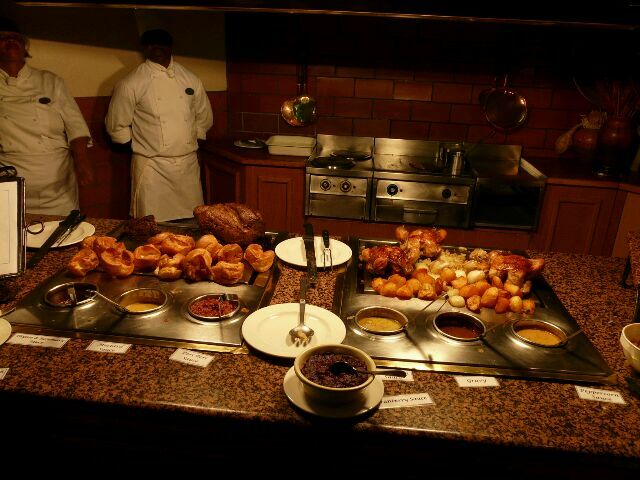 Humongous buffet and carvery. Very pleasant ambience and a good time was had by all. All in all. The attentive reader will have noticed that the Innkeeper has very astutely steered the trip wide of curios, leather goods and carvings of all descriptions. I am not going to go out without a fight and have plans of my own. We shall see. Hah! Indeed we hall.... Our second day at the Cathedral Peak Hotel was packed with activity. Such as eating breakfast. And reading in the pub. And admiring the view. We had to find time, of course, to fit in morning tea with scones, a light lunch, a brisk walk back to our lodgings for an afternoon nap, a brisk walk back to the pub for an aperitif and dinner. Which was more or less a reprise of the previous night's buffet. New main players in roast leg of lamb, roast pork, lamb shanks, prawn curry and grilled trout. Same supporting act of spuds, spinach, pumpkin and so on. Not awe-inspiring, but close to as good as a buffet can get. The best buffet I ever saw was on the cruise ship the Norwegian Gem when Anna and I were on our honeymoon. All the usual suspects as above, but with the addition of about five 'live' cooking stations where food was prepared on order. A pasta station, a steak grill station, a pizza station and so on. 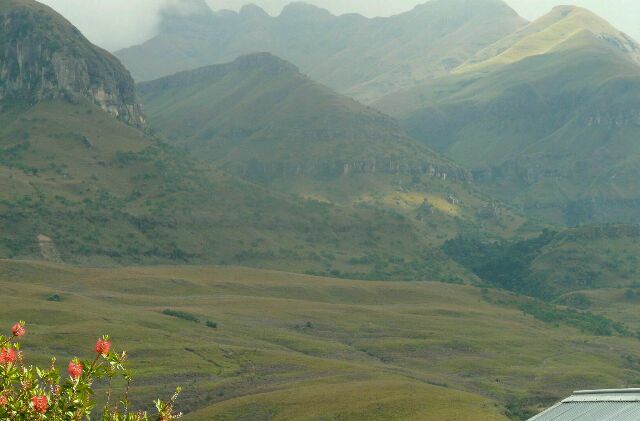 Oh, what a trip that was..... We left the mountains and headed to the Kwa Zulu Natal Midlands, located, amazingly enough, more or less in the middle of the province. 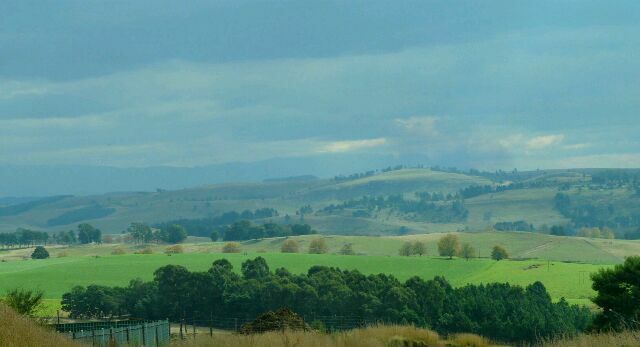 A rural area of rolling hills. Very English. 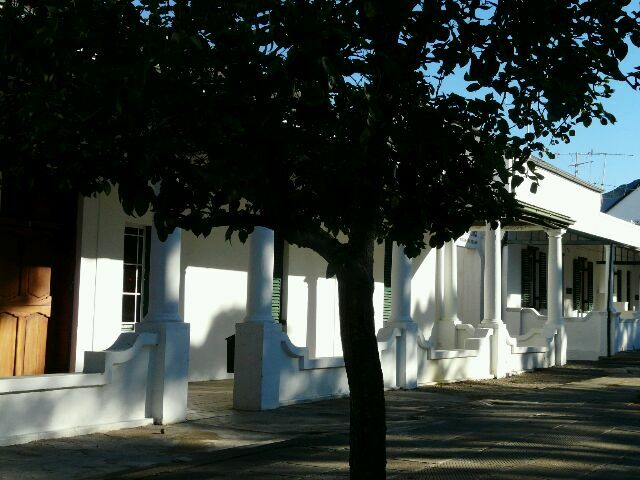 This is the heart of the old Natal colony. As we approached, I could feel my upper lip stiffening. We had to physically restrain each other from uttering things like "jolly good view, what what?". 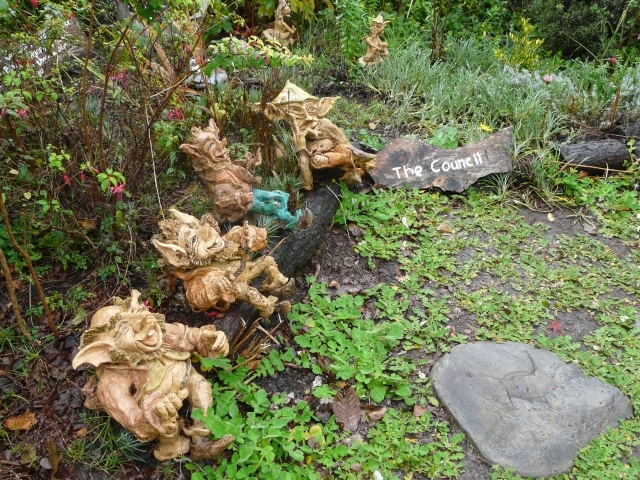 Our destination was the Midlands Meander, a tourist route formed around various hostelries, artists, crafty people - no, sorry, that should be crafts people - and so on. We had a quite splendid map, and entirely due to Anna's research, a bloody good idea of what we wanted to do. We would find a jolly good place to..... WAIT! HALT! There I go with the pommy stuff again! No more, I promise. 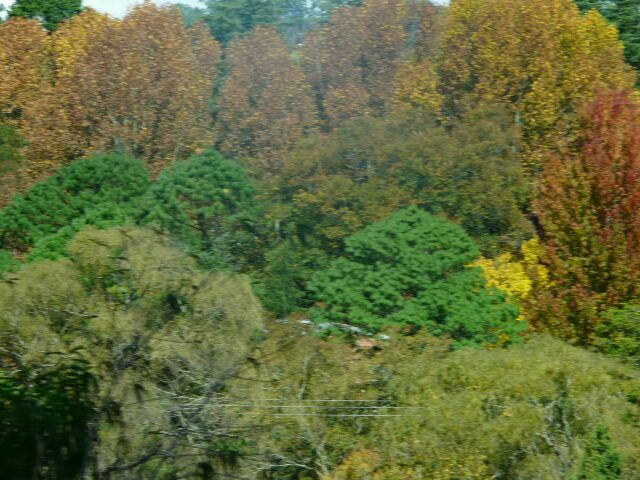 The autumn colours in the Midlands are spectacular. 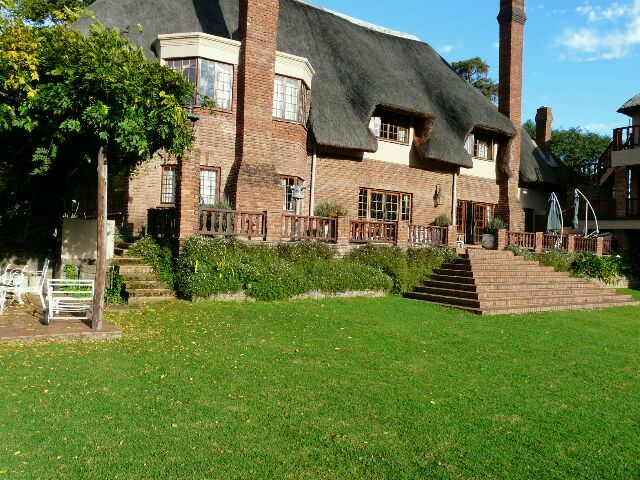 We found a great place to stay at The Bend, an old country manor outside Nottingham Road. The honeymoon suite mit fireplace at half price. 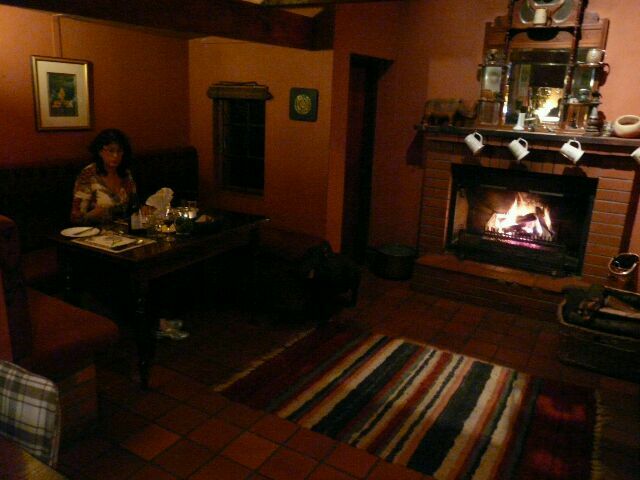 Dinner was a three course meal in a very cosy corner next to the bar. Butternut soup, fillet steak (Innkeeper), stuffed chicken breast (Anna) and malva pudding. Really good. Except for the malva which was stodgy. Entirely due to Anna not reminding him, the Innkeeper did not take pics of the meal. It had, I assure you, nothing to do with the amount of wine we consumed. I will rectify this next dinner. Next day we will venture forth on the meander. Is this the day when we will learn the true nature of Anna? Will her true intent at last become known? Will she keep us in suspense? Tune in tomorrow for the answer. We came to the Midlands mainly because it is there. A place that neither of us have seen. And because the place is jampacked with arty people. We would therefore, whilst admiring the scenery, be able to better our artistic appreciation. Philistines that we are, art-wise, this seemed to be a splendid idea. Hah! We clearly have no idea. I can, on an intellectual level, understand that practically anything can be regarded as art if an artist wishes to make it so. On a purely visceral level, though, I recoil at art that is ugly. Ugly as in ugly. A turd has been exibited as art. Art? Maybe. But ugly? For sure. So we ended up at Ardmore Ceramics. Highly collectable pieces made by a group of black artists. Sought after. 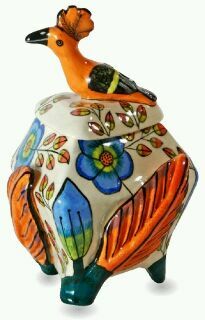 R200,000 on auction for a vase. The Queen has one. So has Hilary Clinton. This is what their work looks like. Ugly. We would not buy this. Also please abandon all thought of an Ardmore piece for one of our birthdays. For us, art should also have aesthetic merit. We accept that lack of it does not neccessarily render a work lesser art. Subjectively, though, art is for us is like wine. It may be a highly thought of wine. If we don't like it, we don't drink it. Sela. 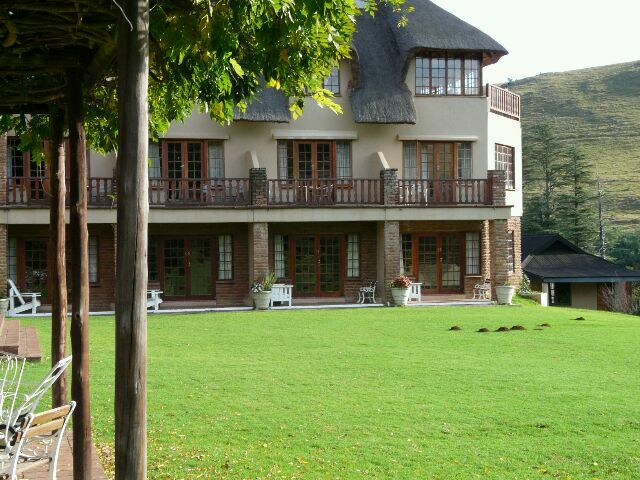 The Midlands Meander is much like the curate's egg. Good in parts, bad in parts and as a result, spoiled. 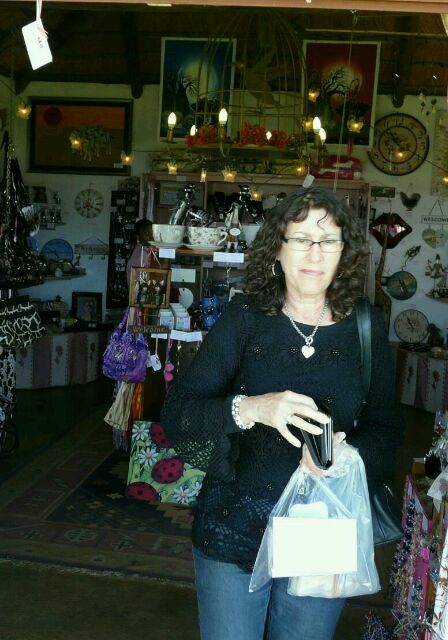 There are excellent arts and crafts but many more purveyors of dubious goods. Whole shops devoted to selling Chinese junk, located in dubious surroundings. Other places looking more at home in the countryside. 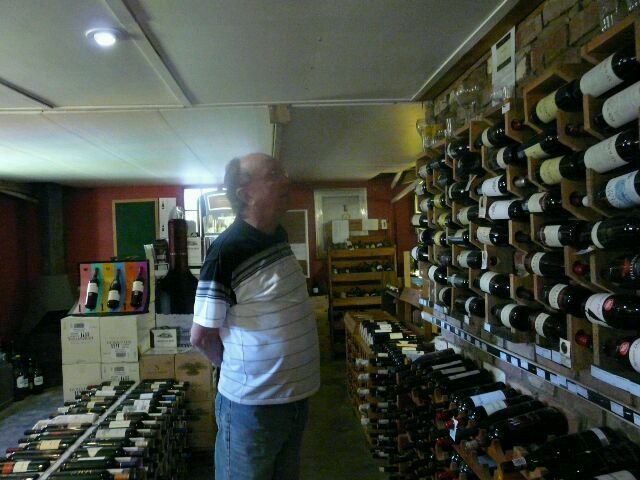 A really great wine shop. And the odd place where Anna made a contribution to the local economy. Overall, though, more bad than good. The observant reader will have noticed that no mention has been made of lunch. That is not because we did not eat the midday meal. No. It is because it has been so uniformly bad that we have only eaten toasted sandwiches as the item least likely to be buggered up. And even then we have had evil toasted samies. Right out of a Stephen King novel. I still wake up at night, sweating, the images of that roast beef thing chilling my blood. I just thought, dear reader, that you may well become bored by our dining failures. I will therefore only report good food. Assume, by default, the worst. If the above gives the impression that the Midlands is a total washout, that is not correct. Do not come here for the art. Or the crafts. Or the quaint shops and, heaven forbid, the eateries. 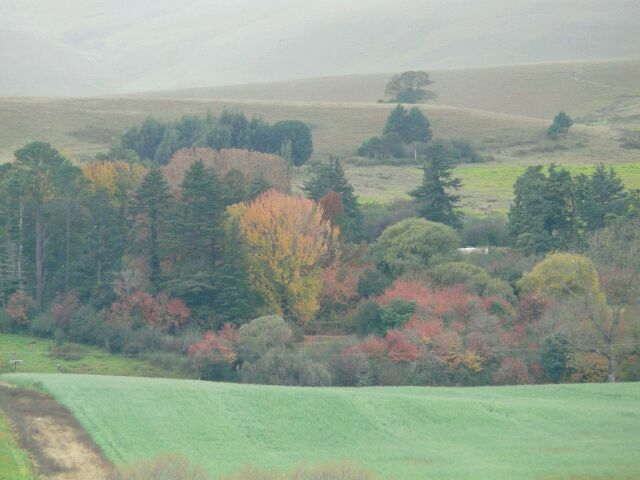 But do come, especially in autumn, for the scenery. And the colours. 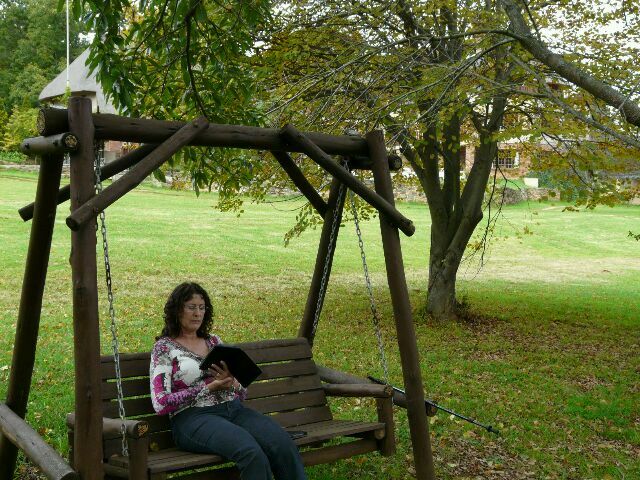 Today we hung around the lodge, reading and chilling. Not sure what the morrow will bring. Bound to be interesting, though. 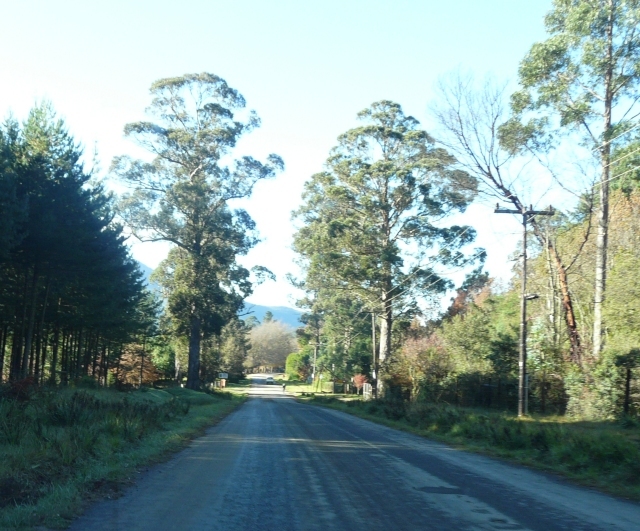 We noticed that the road from Nottingham Road to our lodge was splotched with brown stains. Peculiar. Until we realised that the road must have been built on an ancient pathway. 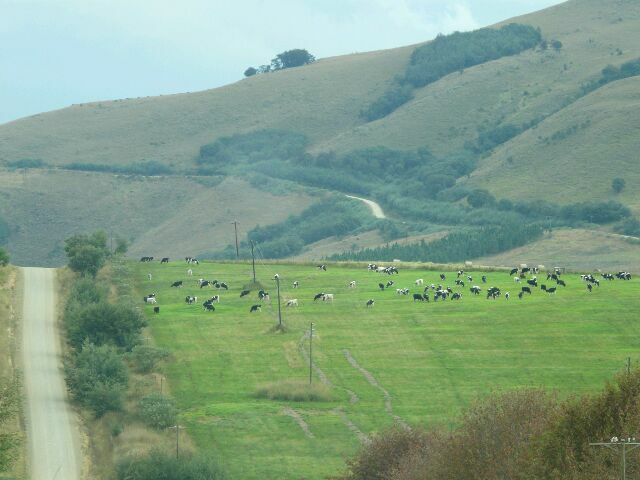 This was when we experienced the migration of the cattle. Swaying along in the road, chewing the cud and contemplating life's small puzzles. As: When should I drop the next load of poo? Wait, wait - here's a nice clean piece of road. Let her rip, baby! Splosh! Very rural and charming. To get the animals out of the way was like parting the Red Sea. Surrounded by cows, squishing through the poo, one proceeds very slowly. The cows don't care - the murmur of the engine probably just sounds like other cows farting. We left the Midlands and trundled through PM (That is Pietermaritsburg to the new hands), and found ourselves eating calamari heads on the Esplanade in Durban, where the city fathers have apparently not heard that it is winter. They somehow manage to keep the entire city at a balmy 31C. Down the coast to Mtentweni we went to visit Thys and Noreen. Great hosts, good friends, splendid visit. We made an early start on Sunday morning - about 650km to get to Hogsback. This is driving I hate passionately. Starting at A with the sole purpose of getting to B. 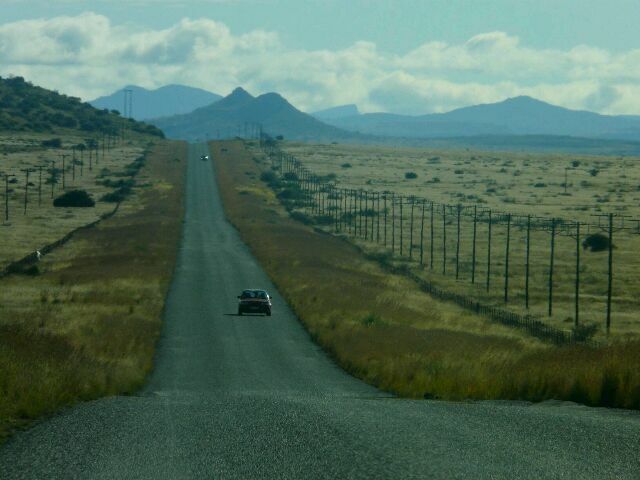 Especially when you know the the road is going to be exquisitely boring. As it was. 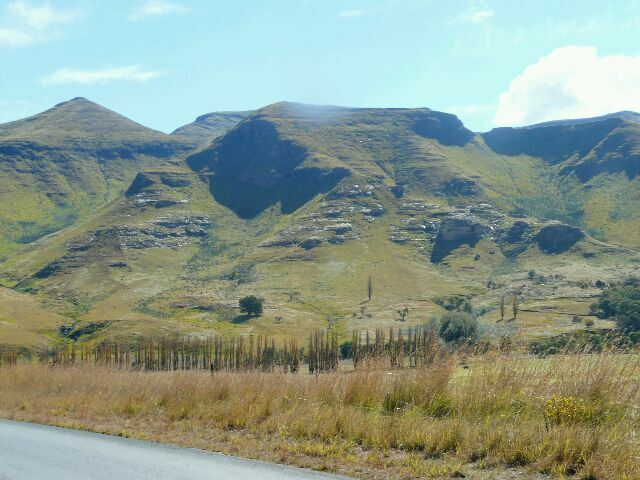 Through rural Eastern Cape. 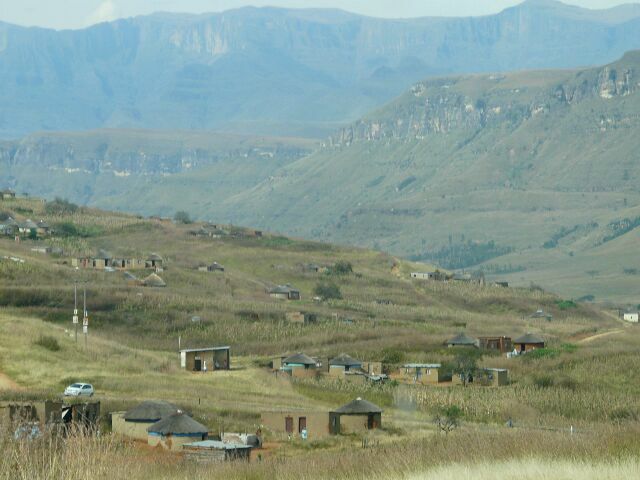 Hills dotted with huts and houses. No noticable agriculture. Except for the odd cow. Clearly a different specie than the Midlands lot, they were content to stay put. And some roadside goats. 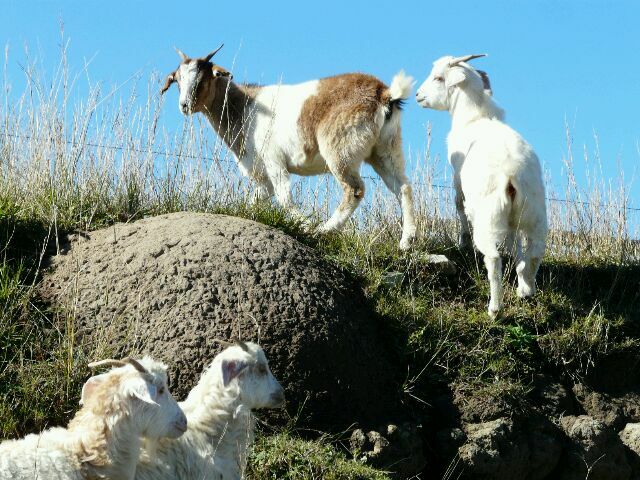 They are again a different type of goat (specie roadsidus) from the ones found on actual farms (specie farmicus). We passed through a few thoroughly buggered up small towns. 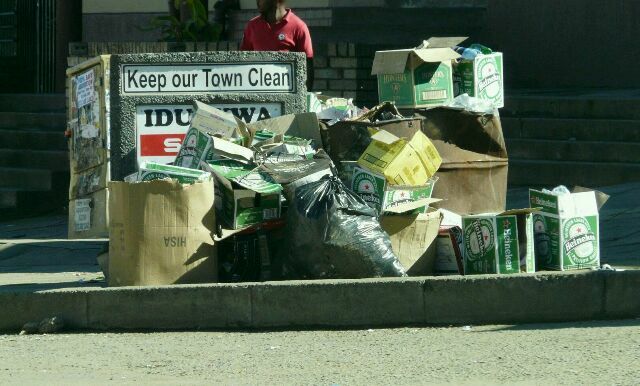 Dutywa, Butterworth. Looks as if there is no local goverment operating at all. Really, really awful. A thoroughly boring and, in terms of civic neglect, a thoroughly depressing drive. 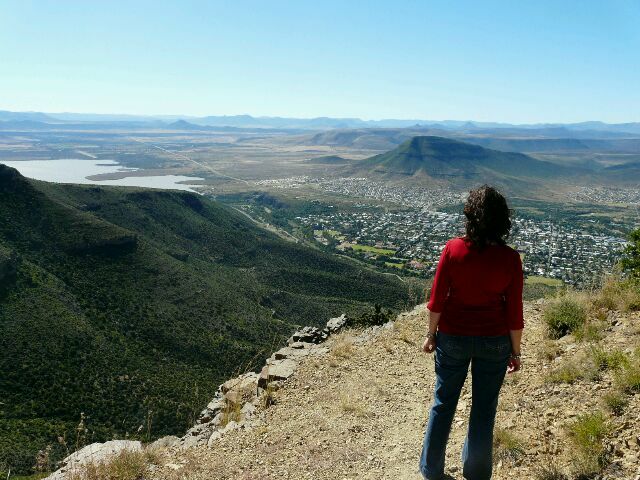 It seemed to take forever, but we did eventually reach Hogsback. Which deserves its own fresh blog. Tomorrow or so. I am suspicious. Anna is capable of far more sneakiness than I have up to now suspected. When Thys said "What is all this stuff on the back seat? 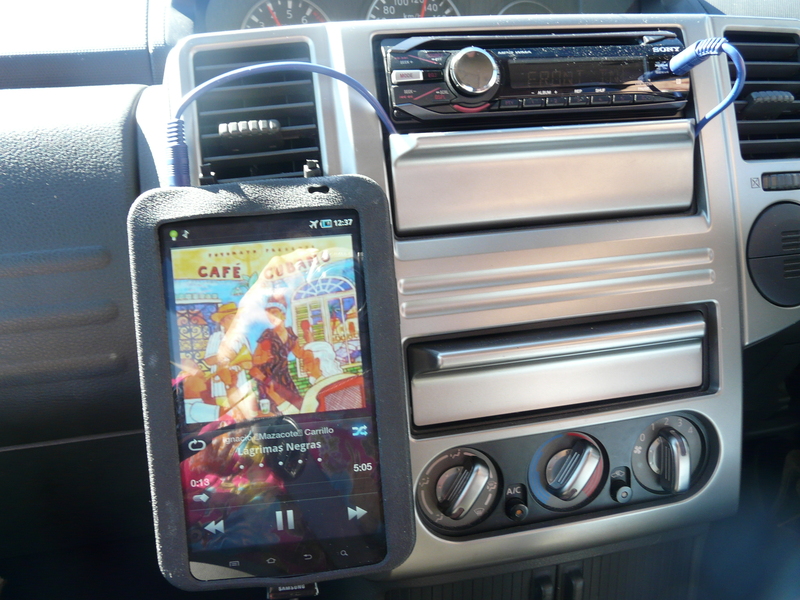 ", I realised that we now effectively have a two seater XTrail. 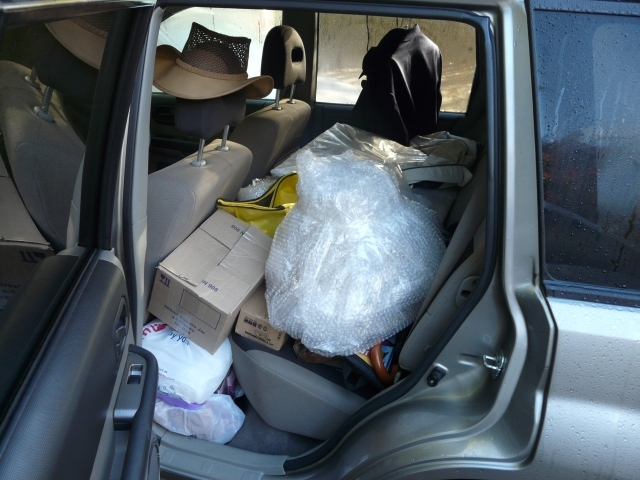 The back seat area is filled halfway to the roof with stuff. The woman has sneaked through my guard and slyly did a slow accumulation of stuff. There is enough in the car to stock a stall at the market. A large stall. How could I have been so naive? Tee-hee!!!! I have been informed that I exaggerated the state of the car's back seat. That it is, in fact, only covered with a thin layer of stuff. I pride myself on the fact that this blog purveys the truth, only the truth and the whole truth. I lay before you hard evidence regarding said motor vehicle's back seat. 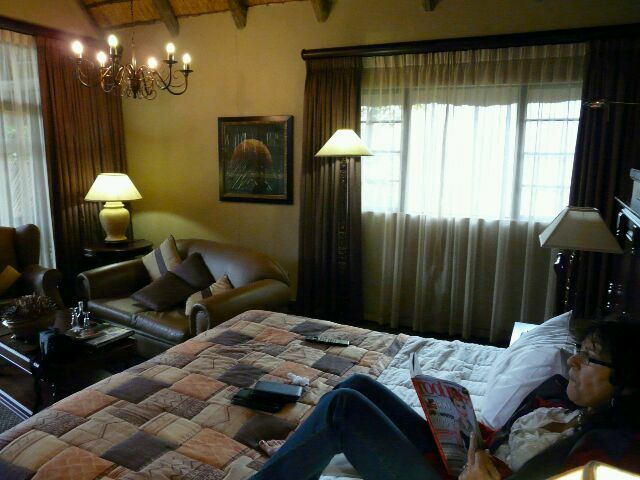 We found good lodging in Hogsback at the Arminel Hotel. Very good rate as well. 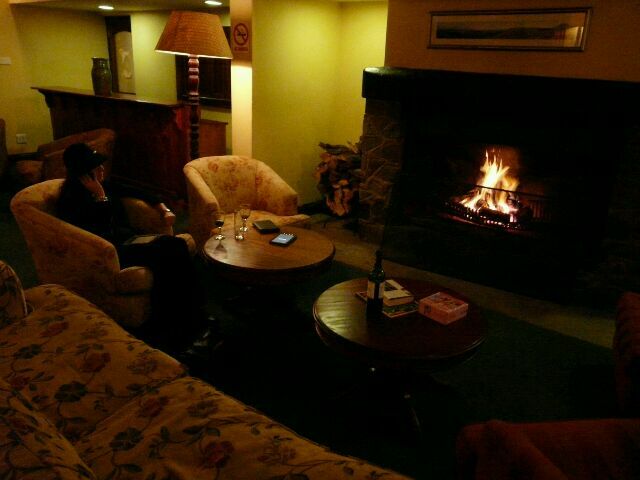 Great lounge with fireplace. The room was ok, if a bit below par compared to the public areas. The food, however, sucked big time. 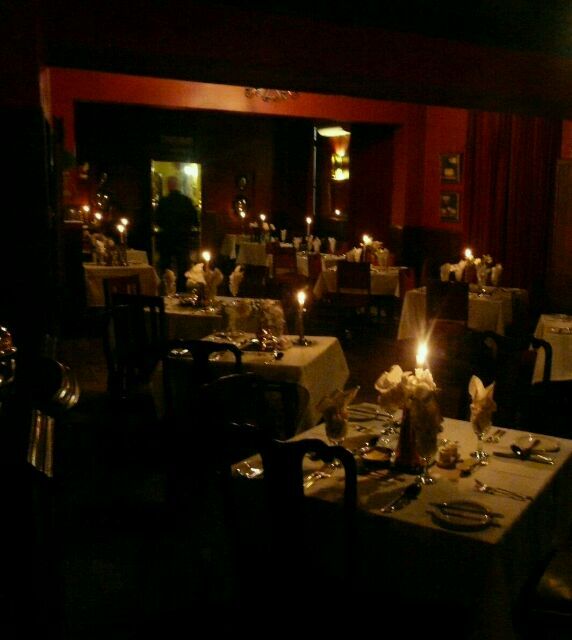 Dinner is a table d'hote affair of four courses - soup, fish, mains and dessert. 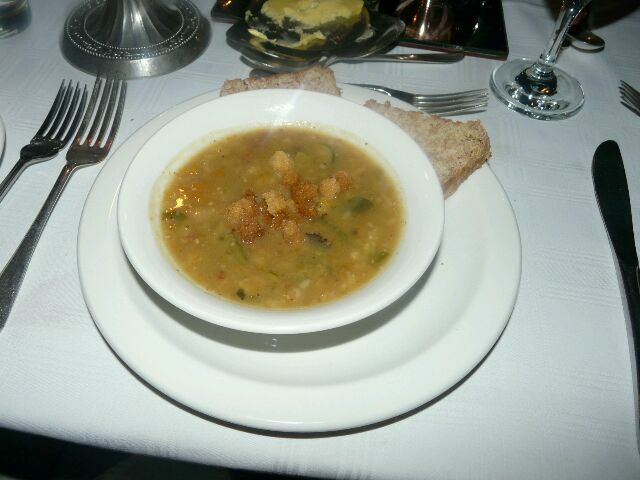 Our expectations were raised sky-high on the first night when we were served a superb vegetable soup with barley. Extraordinary. This was followed by a limp but edible piece of battered hake. With a slice of lemon. Then came the mains. 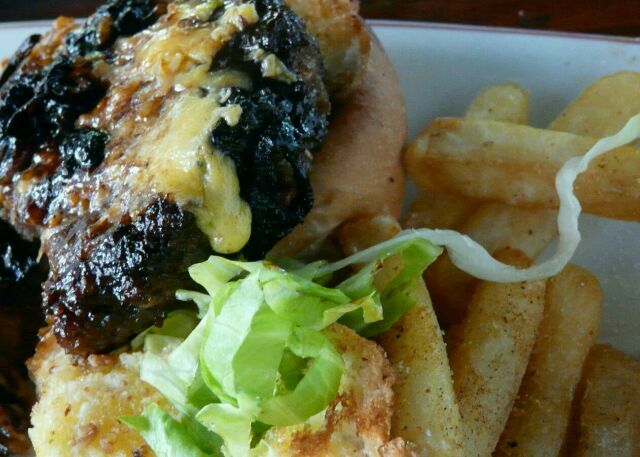 Anna had braised chicken and I a fillet cordon blue. I could not believe that this stalwart of the 60's was still around. Fillet steak pounded into an oblong, topped with ham and cheese, rolled up, crumbed and slow roasted, The Armitel's version had two problems - the crust was like concrete and the thing was raw and cold inside. Ghastly. Anna's pieces of chicken were adorned with a transparent substance which we supposed was meant to be a sauce. It had the consistency of glue and a taste of raw vinegar. Needless to say, we went on to dessert which was an edible apple crumble. Breakfast was just acceptable. Except for Anna's fish cake which was old. Very old. Dinner the next night was worse. Anna had a sweet butternut soup which she pronounced ok and scoffed. In case this was the last edible dish of the evening. I had something that was described, with considerable literary license, as "mixed hors d'oeuvres". I got a small plate with two tired mussels and what appeared to be various bits of fish, shrimps and calamari with a pink substance clinging to it. It was indescribably vile. Almost impossible to believe that they could manage to get so much wrong on such a small plate. The mussels were tough, the calamari even tougher, the shrimps reeked of iodine (sure sign of age) and the fishy pieces were suspiciously fishy. 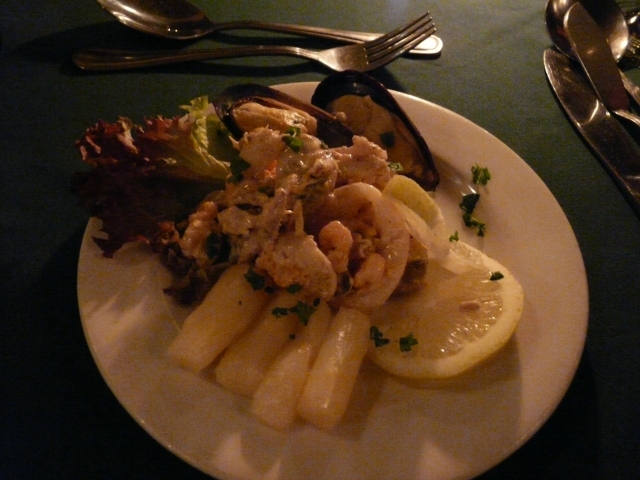 To add insult to injury, the mess came accompanied by 4 pieces of tinned asparagus lurking on the edge of the plate, This was, I think, the worst food that I have ever been requested to eat. Here is the corpus delicti. For mains I opted for roast lamb and Anna oxtail. The lamb was ok, except for the gelatinous gravy. 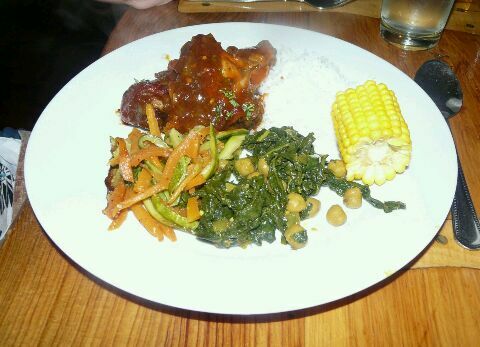 The oxtail was completely sans flavour - braised to death in water with some veggies thrown in. Completely off the bone. Bland. 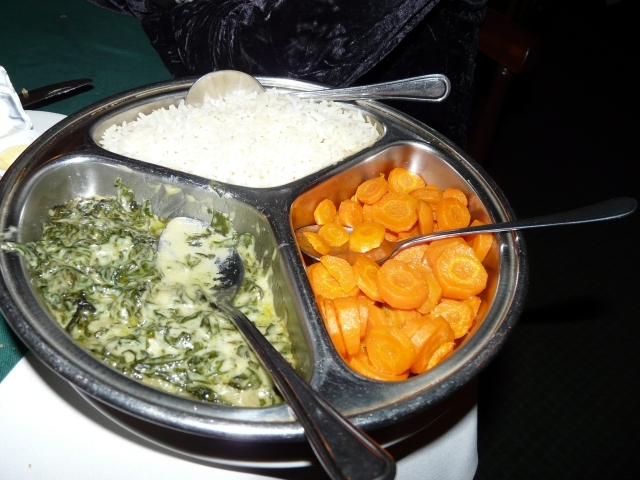 Served with what the menu rather optimistically described as a "bouquetiere" of vegetables. This was what arrived: Anna gave up and I bravely soldiered on to dessert. Crepes Suzette. I have never seen CS (as us old hands call it) fucked up to the extent this was. What the chef did, was to fold two crepes into triangles, cover them with an orangy sauce thickened with corn flour and then heat it up in a microwave. Voila! Crepes Suzette! Hah! By now we were so inured to bad food that we had come to expect it. And became determined not to allow it to spoil the holiday. 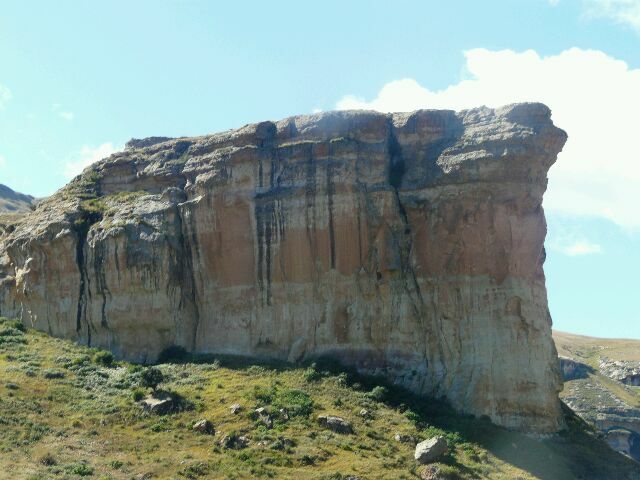 So - on we went to explore Hogsback. 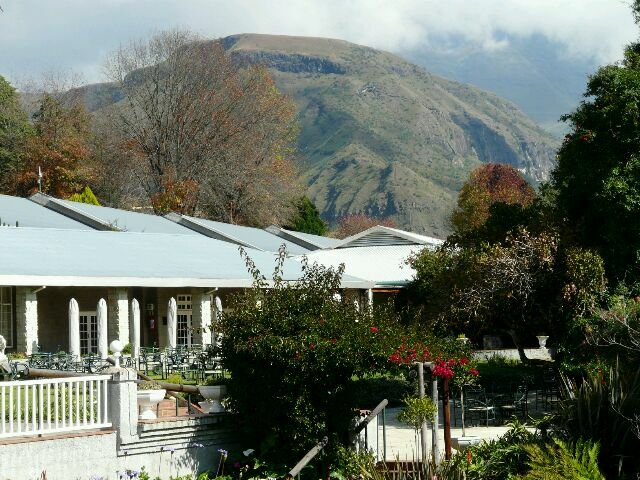 It is a teeny village located on the slopes of the Amatola mountains. One main street and about 4 side streets. 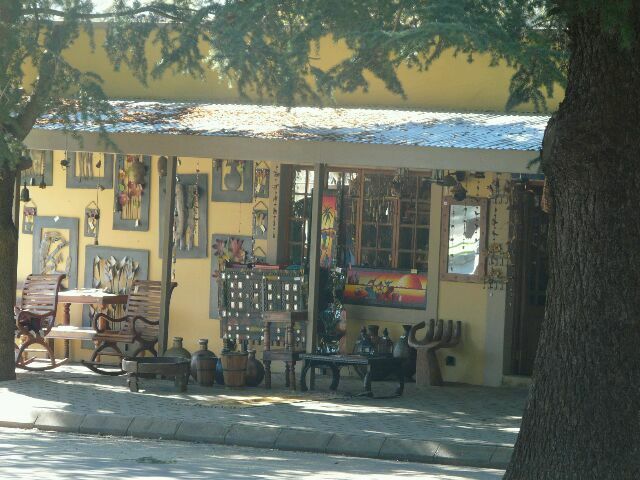 A few crafty arty shops and studios. 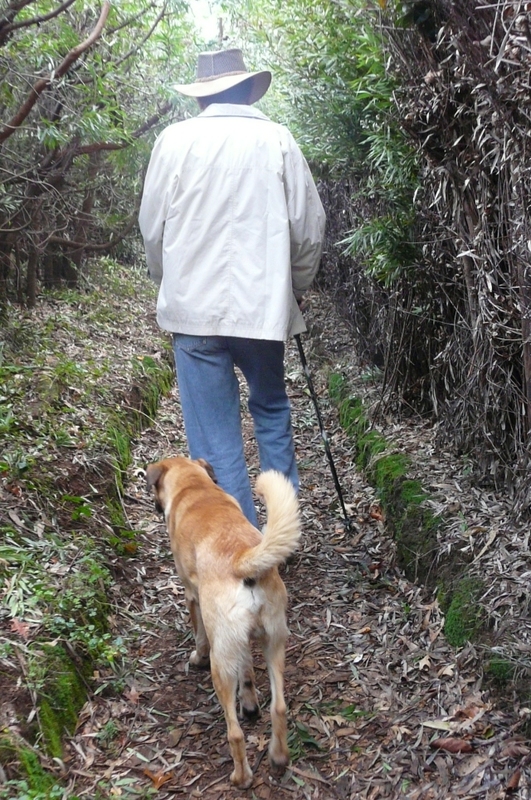 And a village dog named Snoopy, who forthwith attached himself to the Innkeeper and wandered around with us. 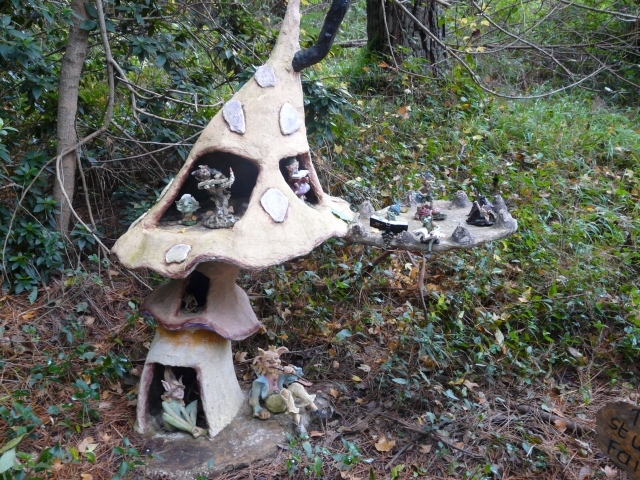 A Fairy walk proved mildly interesting. 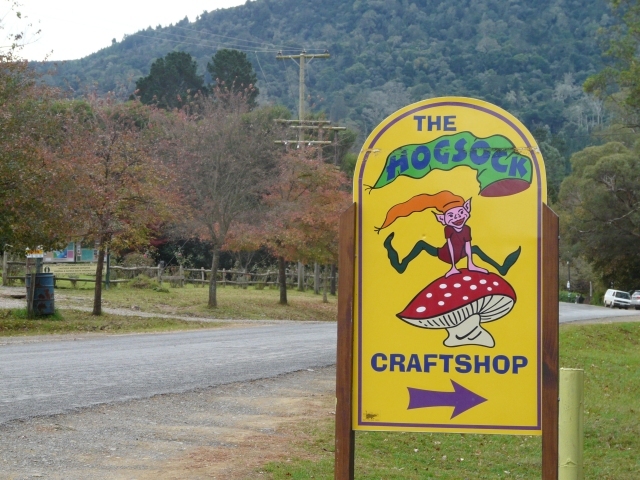 Hogsback is a woody place. As in lots of trees. Arboreal is, I suppose, the correct description. 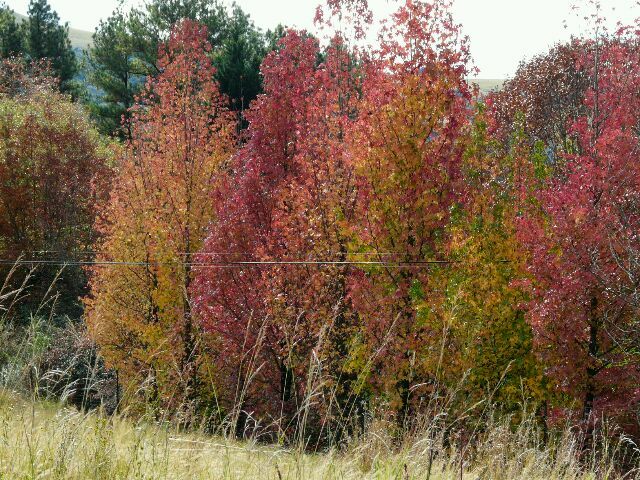 Beautiful autumn colours. Forget the arts and crafts - all very iffy. The woods are magnificent. 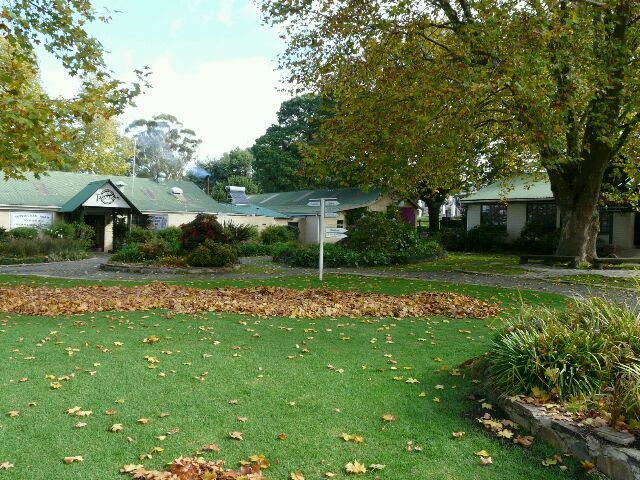 All the rest, except for the main buildings of our hotel, are ramshackle and backwoodsy. We had lunch in a place called "The Barn". Great setting for a movie. Wooden barn with a fireplace. A rather scruffy place with some scruffy characters hanging around. 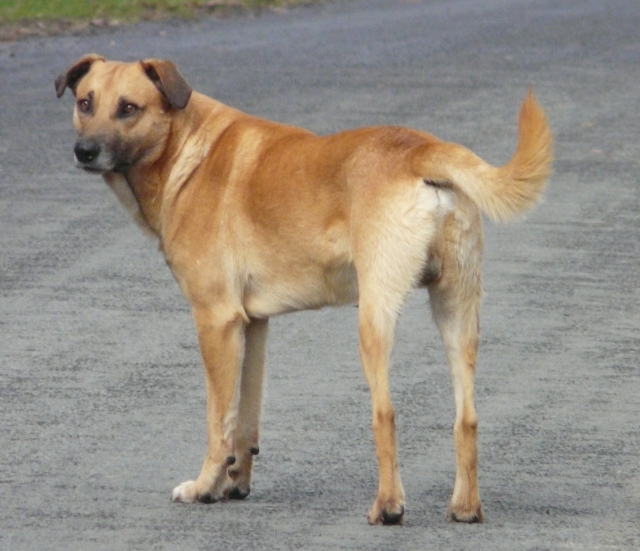 Here we lost Snoopy - he was not welcomed by the Barn's pooch and had to leave. As well. I may just have added him to the load on the back seat. It started raining. 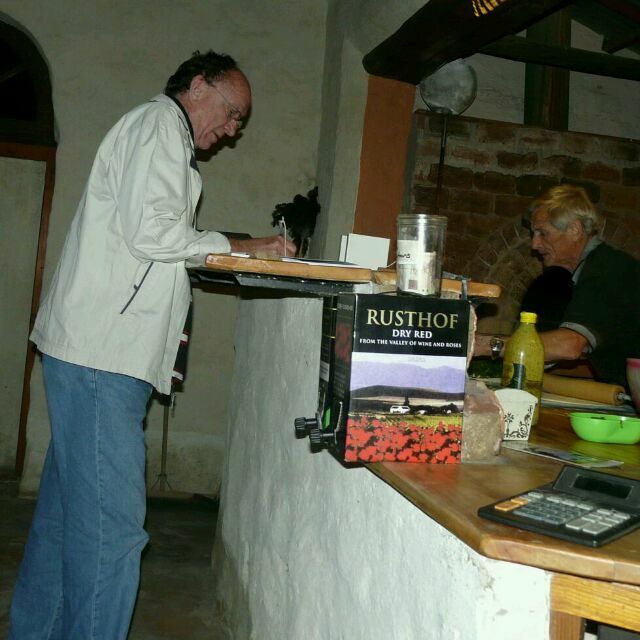 Or rather, pouring, and we hastily repaired to the hotel for a quiet afternoon of drinking wine and playing cards. Write this down somewhere. Do not play cards with Anna. She is a bloody card sharp. Bottom deals, middle deals, false cuts, cards in the bra - she can do them all. 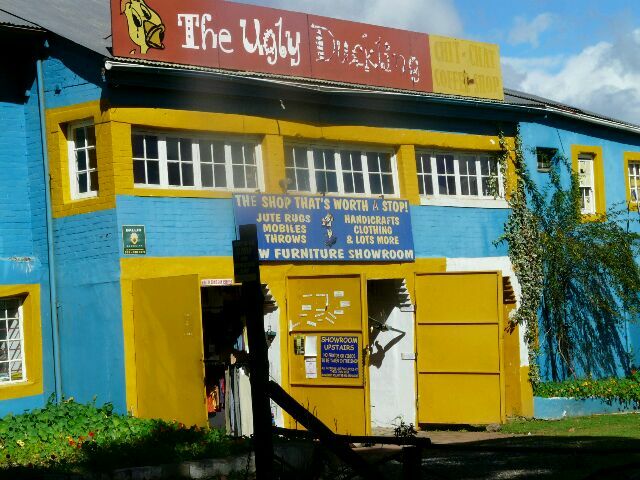 The consensus is that Hogsback is well worth a visit for the setting. 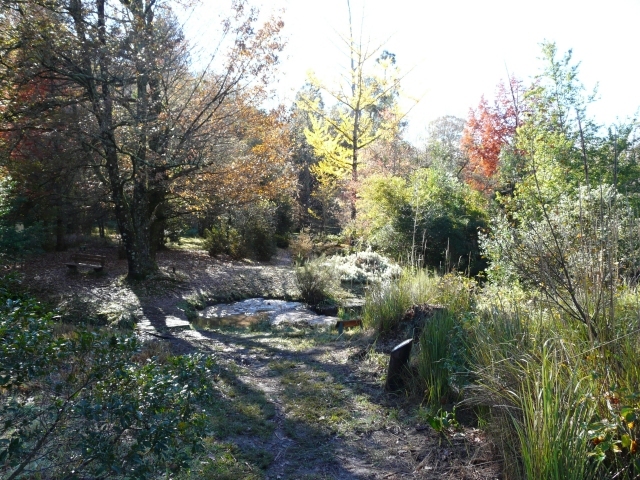 If you require a peaceful weekend away, go to Hogsback. Just take your own food. 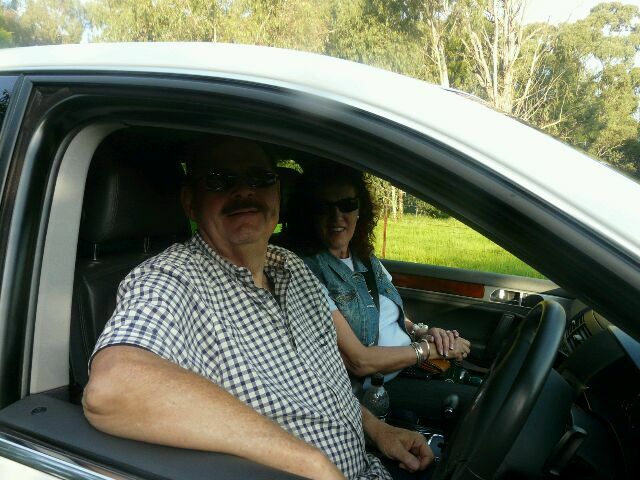 We left for the Addo Elephant National Park. 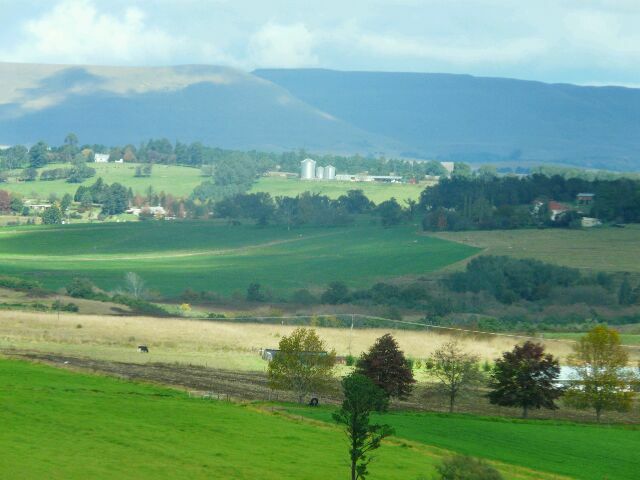 A pleasant drive through the Eastern Cape countryside. As we passed through Alice, the Innkeeper's groenmielie (corn on the cob) sensor went off and Anna was dispatched to make a purchase. 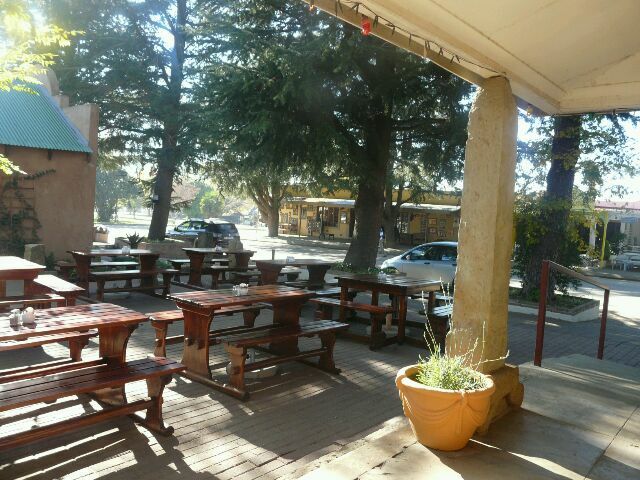 Glorious prospect - fresh mielies in the Addo! Alice, by the way, is a very small town and is very well kept. Clean and, so it seemed, in working order. Guess it all comes down to efficient management..... We arrived late afternoon at the main camp in Addo and settled into a cottage. The mielies turned out hard, but still edible. We had salads and grilled chicken for Anna and a glorious T-Bone steak pour moi. The next morning we set out to explore the park. 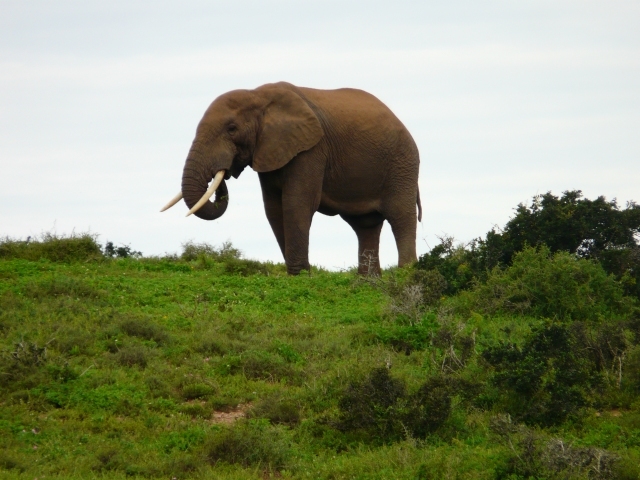 Addo was a huge disappointment. It is not the African bush - more like the African shrubs. No trees in sight at all, just low shrubs. 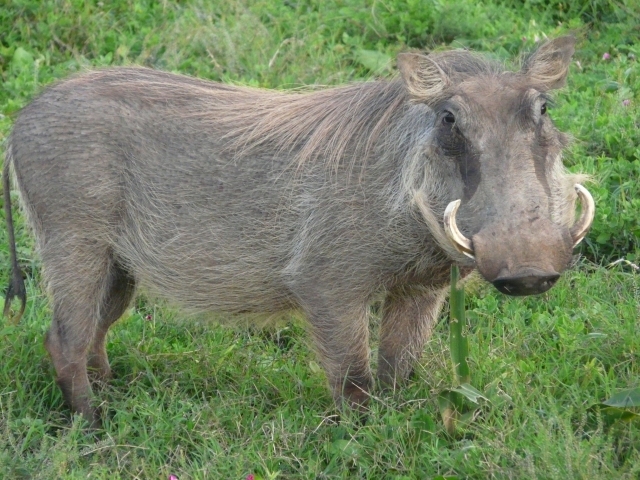 This is just not what the flora in a game park should be. There should be trees, dammit! It does not feel right, somehow, to see the animals in the shrubland. The place is also seriously small. A 5 hour drive will see you negotiate all the roads in the park. 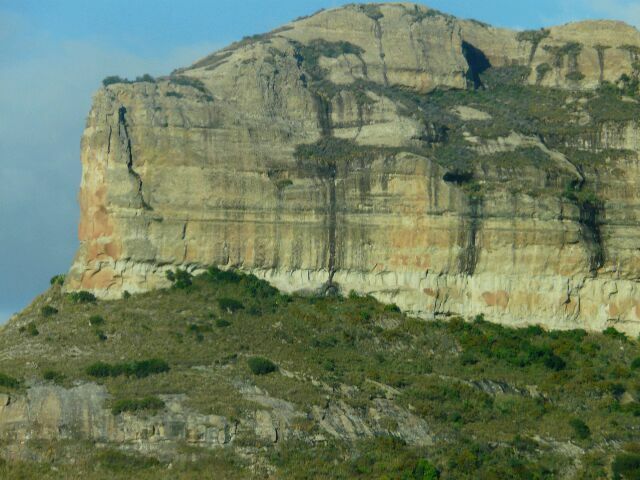 Because of its size, the outside world is never far away and one frequently see Port Elizabeth, or a railway line or neighbouring civilisation in some form or other. Never got the feeling of being away from it all. The variety of game is iffy. 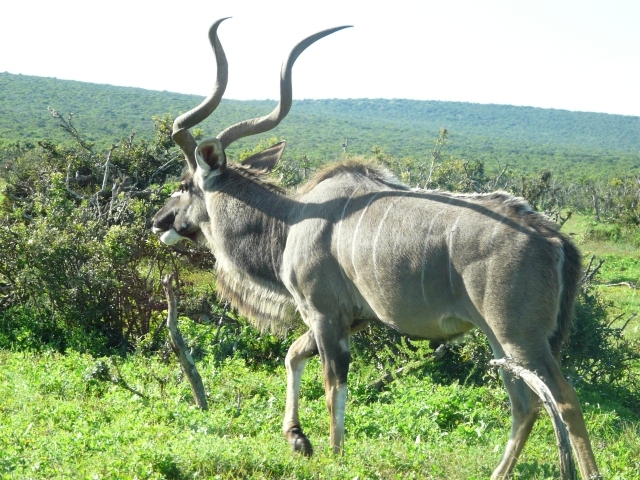 Expect to see lots of elephants, kudu, warthogs and zebra. Very little else. Here are a few obligatory animal pics. 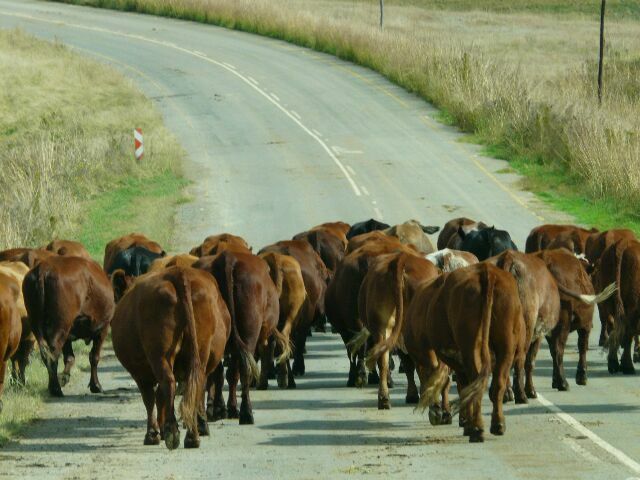 We left Addo earlier than we had intended and headed for home. The promised reportback on the roads. 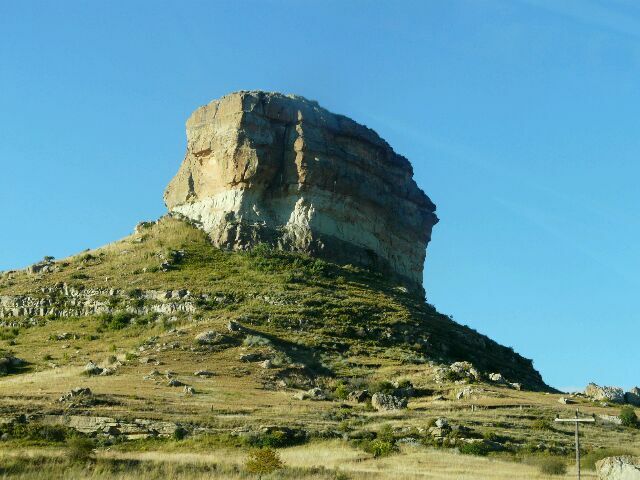 We did around 3200 kilometers of which about 100km was potholed, mainly around Zastron in the Free State. 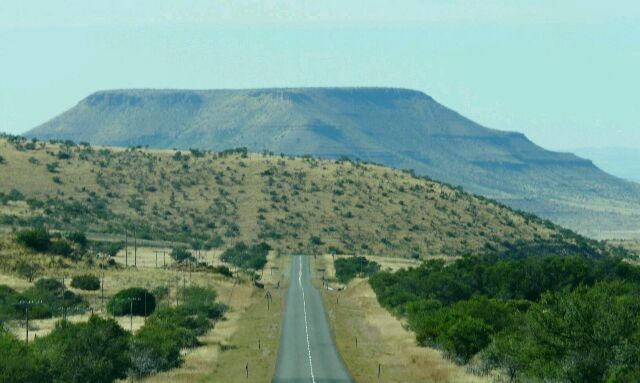 Of the 3200Km, only 325 was along a major road, the N2. The rest were minor and secondary roads. All in good shape. 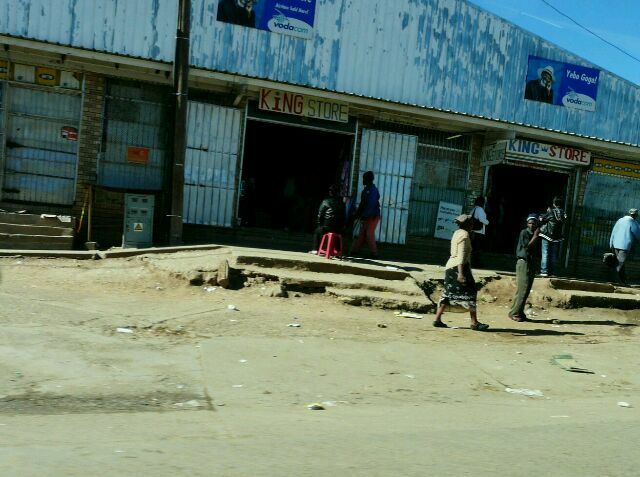 We have previously seen roads in a sorry state - around Newcastle and Middelburg - so I accept that there are roads in poor condition around. What I am not prepared to accept is the statement that our road infrastructure is generally poor. Not, at least, until I am offered proof to the contrary. I sometimes wonder whether people that are negative about things such as the roads wish their statements to be true lest they have to admit that the ANC led (black) government is doing something right. Just to place things in perspective, I googled "potholes in the UK". It appears that there are about 2 million potholes in UK roads. With a total of about 360,000 km paved roads, the UK has on average 5.5 potholes per km. We had a good trip. Visited parts of the country that we had not been to before. Seen sights that we had not seen before. And ate more crappy meals than we have ever done in the same time. Anna has started talking about our planned trip around the world next year. Johannesburg - New York - Washington - Quebeck City - Denver - San Francisco - Seattle - Vancouver - Anchorage - Beijing - Singapore - Johannesburg. In the meantime, though, we are back to doing our Innkeeping thing.